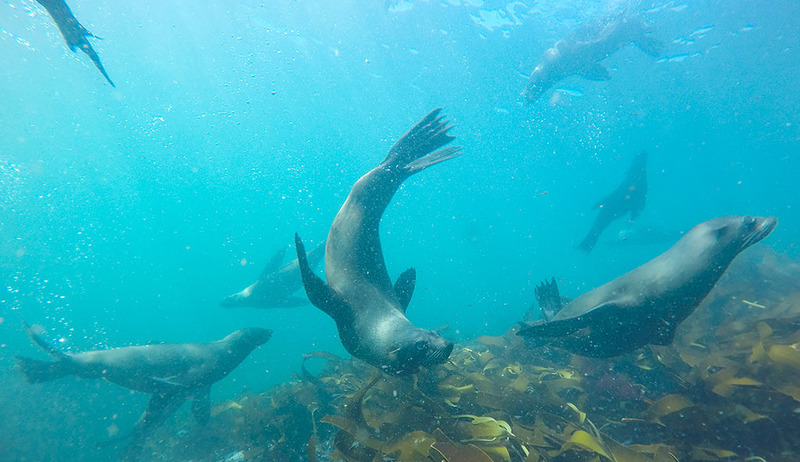 The plan for day 6 was to drive down to Hout Bay in the south west of Cape Town to go scuba diving with the South African fur seals in the morning, and then in the afternoon driving around to Boulders Beach to see the endangered African penguins before returning back home to Kuils River. 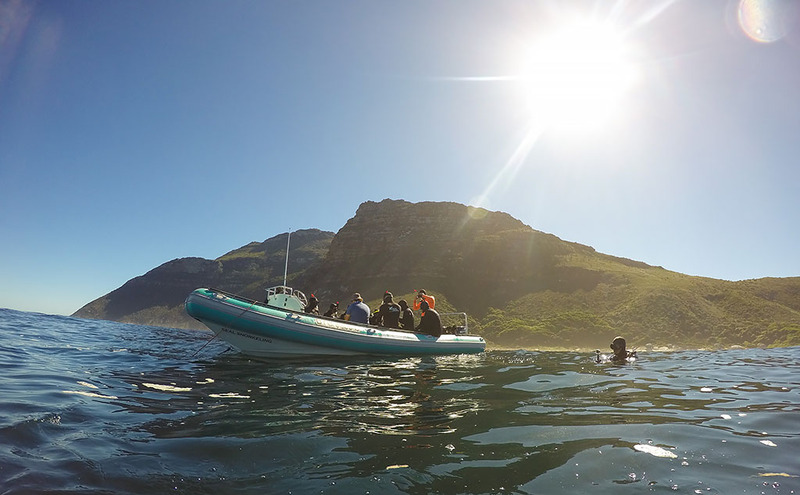 The meetup for the dive today at Hout Bay was at 10am but we didn't want to chance the notorious Cape Town traffic so we left Kuils River just after 7:30am. 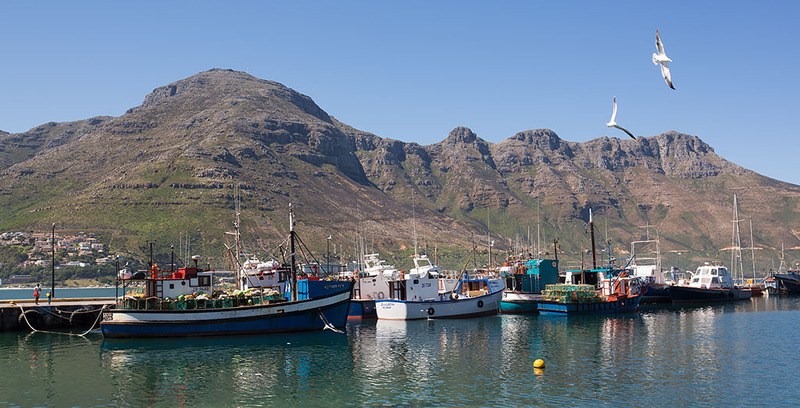 Luckily traffic was fine though and we arrived at Hout Bay just after 9am with plenty of time to spare. 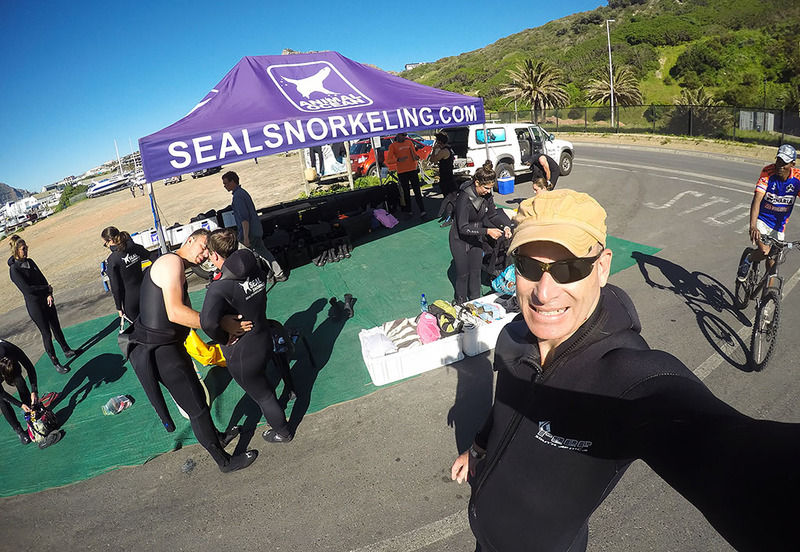 After having a walk around the wharf I went over to the setup area to sign the waiver and get ready for this morning's dive. 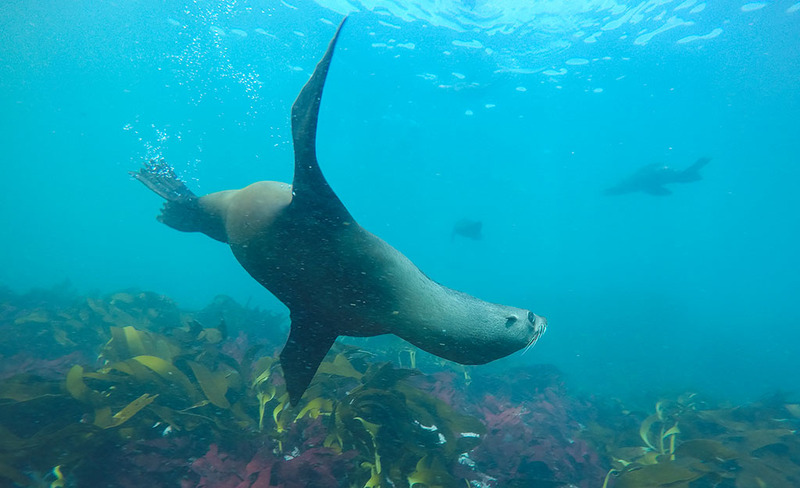 My dive today was organised through Animal Ocean. 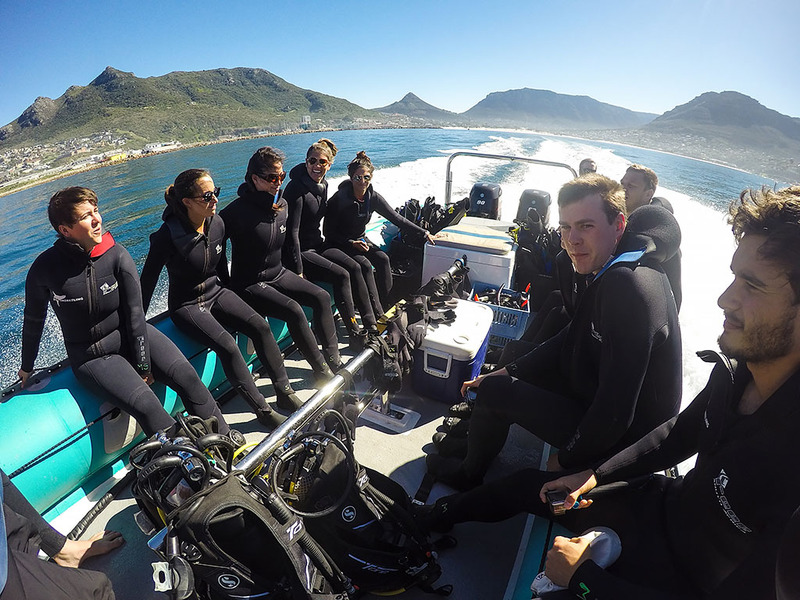 Although Rianda had recently gotten her PADI openwater certification, they had a 20-dive minimum to go out as the water was often quite rough. The weather was absolutely perfect today though, and we really regretted her not coming. 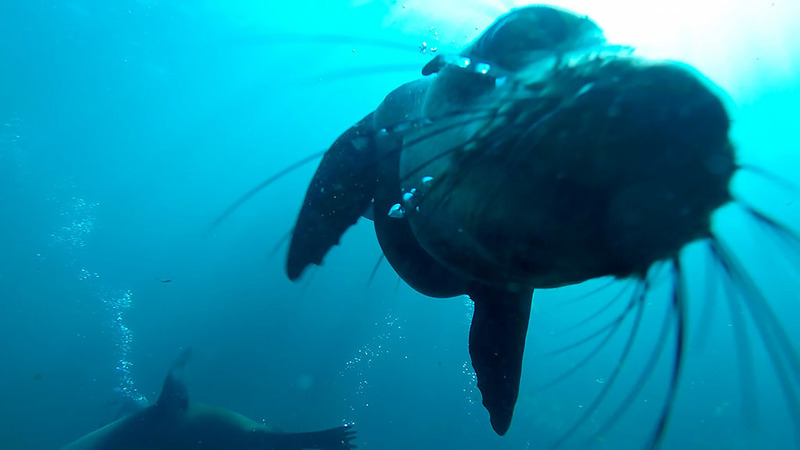 A quick selfie after putting on my wetsuit. 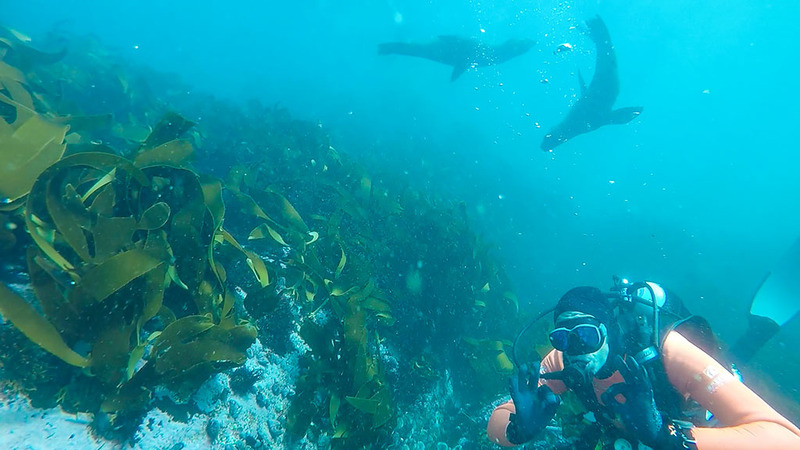 The water temperature was only 10°C today, by far the coldest I had been diving with just a wetsuit on! 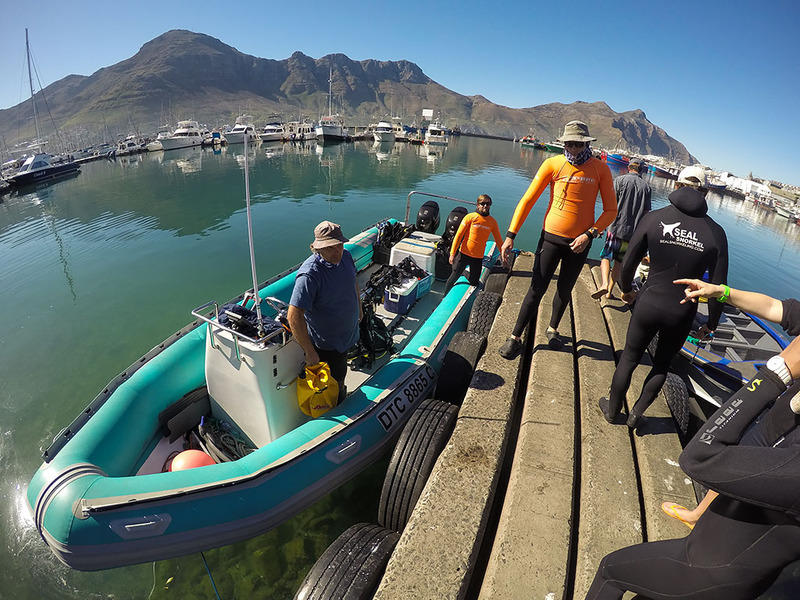 After a quick briefing from our dive master, we boarded the boat for the short ride out to Duiker Island. After my new underwater Nikon failed on my last dive I had since bought a Gopro Hero 4 Silver during a runout sale and it was my first time trying it out. On the ride out of the bay. Today there were only three divers, myself the dive master and another guy, with the rest just going out to do some snorkelling. 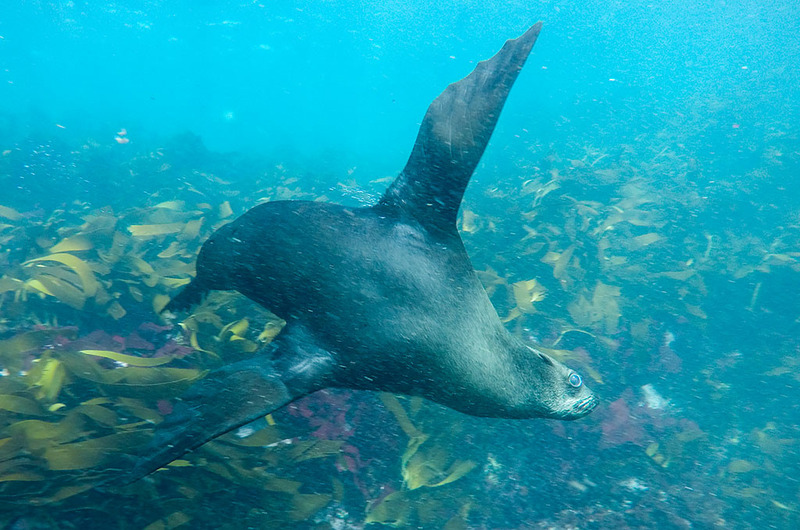 Duiker Island is a small, bare rocky island ~200 metres off the coast and was literally covered with the Cape fur seals lounging in the sun. The scuba divers were first off the boat and into the water. Before the dive I was worried about the swell as it can get quite rough and is often cancelled when it goes above 4 metres. Luckily we had great weather today and the water was almost perfectly calm. 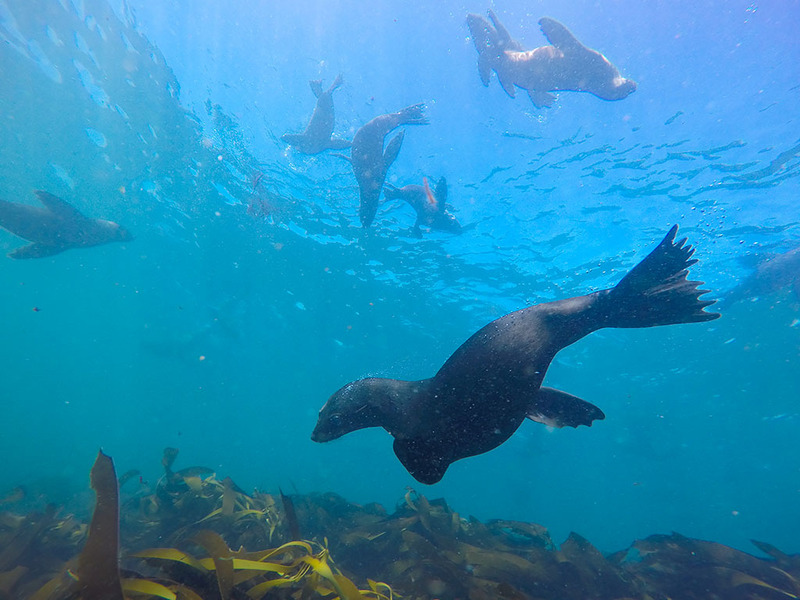 As we descended the super-curious seals quickly came to check us out. 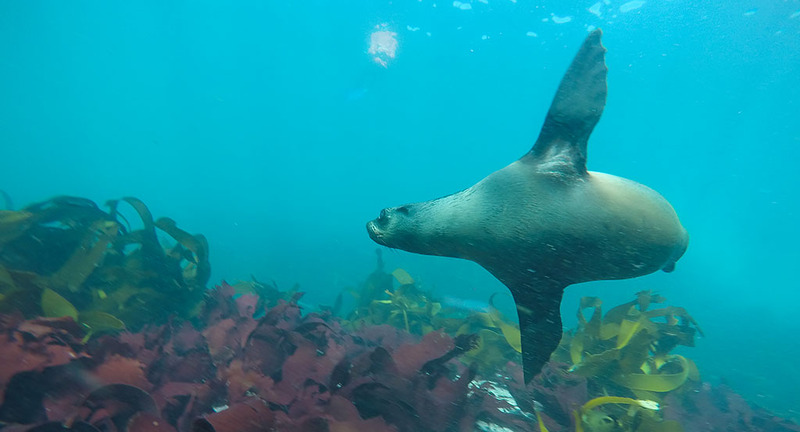 We were only diving at 6-8 meters so there was plenty of light with good visibility. 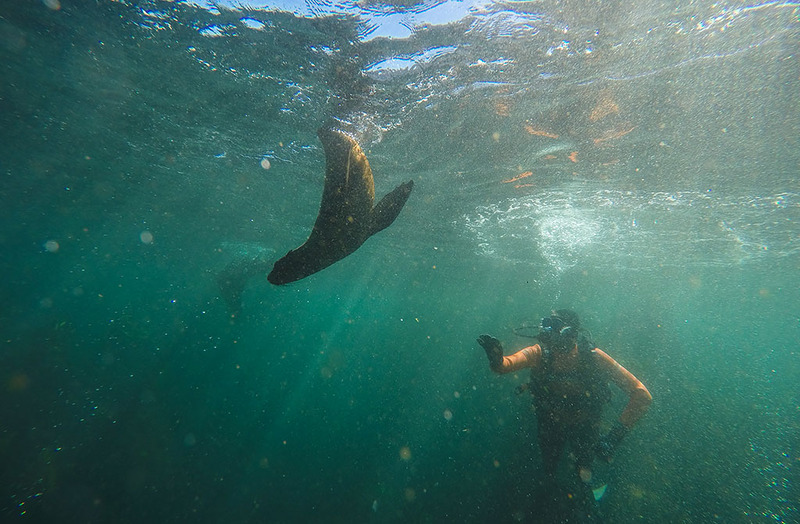 The seals definitely were not shy and would come up to you at full speed and peel off at the last minute! 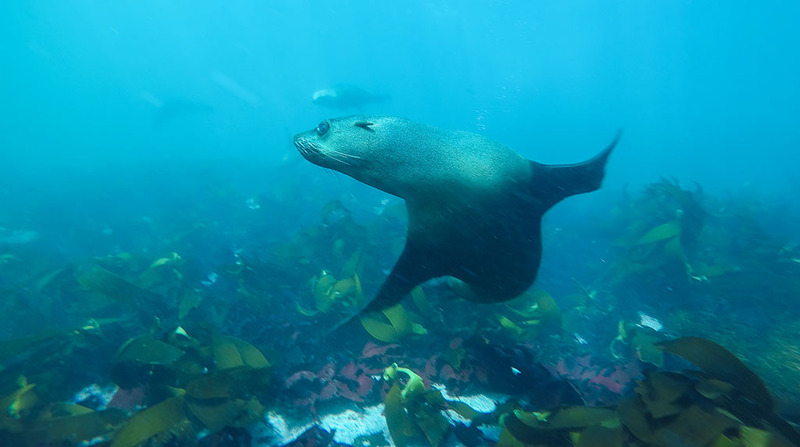 I had been diving with seals in New South Wales, Australia soon after getting my dive certification back in 2001 and it was a real treat being able to do it again. Checking out a small crayfish. There was some wash from the waves/current, gently pushing you back and forth but not enough to carry you away. 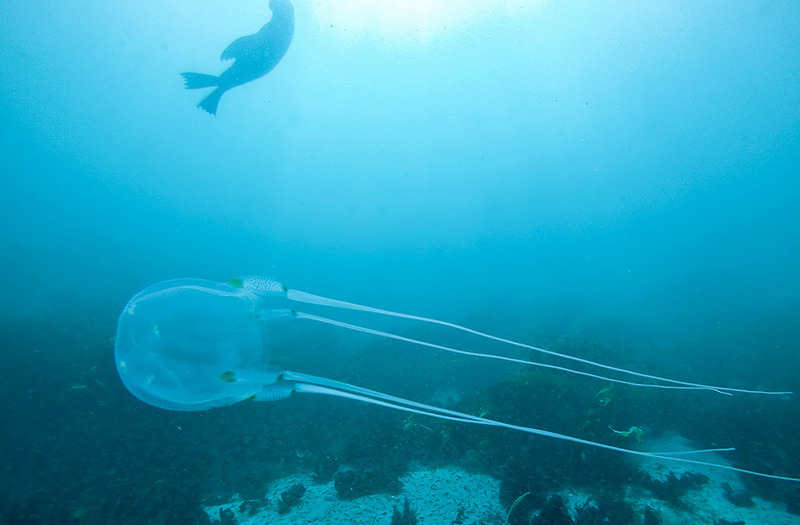 A venomous South African box jellyfish swimming by. 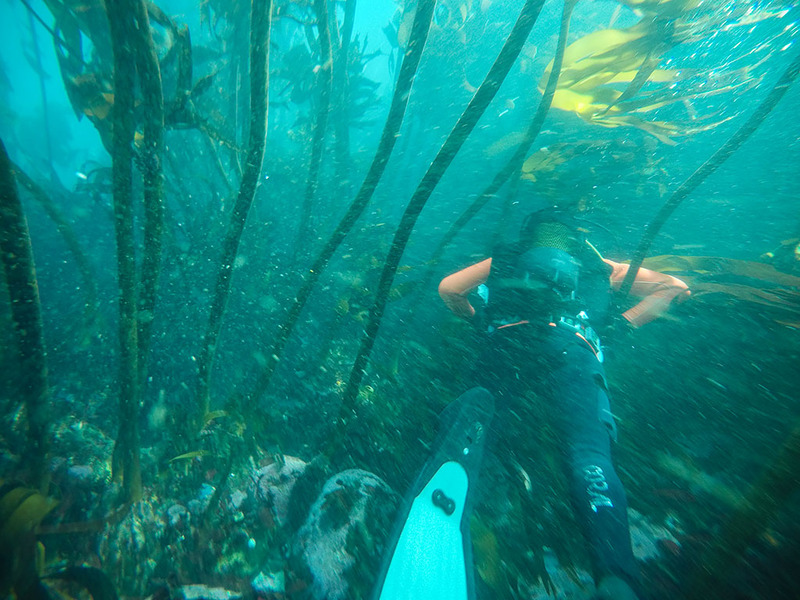 There was also some kelp forests to explore. 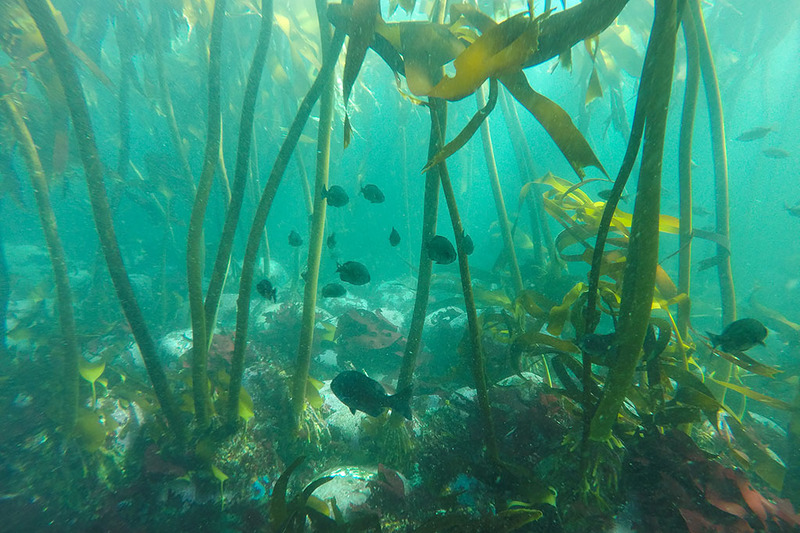 Some of the fish were hiding from the seals in here too. 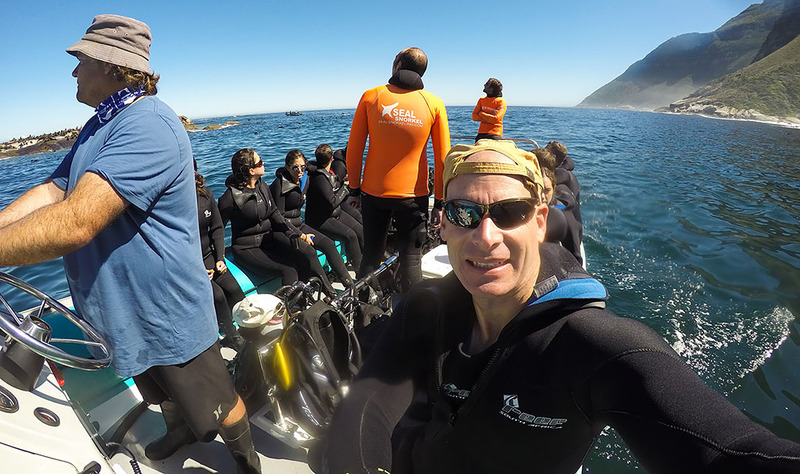 After Maldives, Malaysia and Iceland, South Africa was my fourth country for scuba diving this year and was definitely a place I would love to head back to to do some more. One of the snorkellers just above. This guy getting up close for a sniff! Waving farewell as we head to the surface after a fantastic dive. 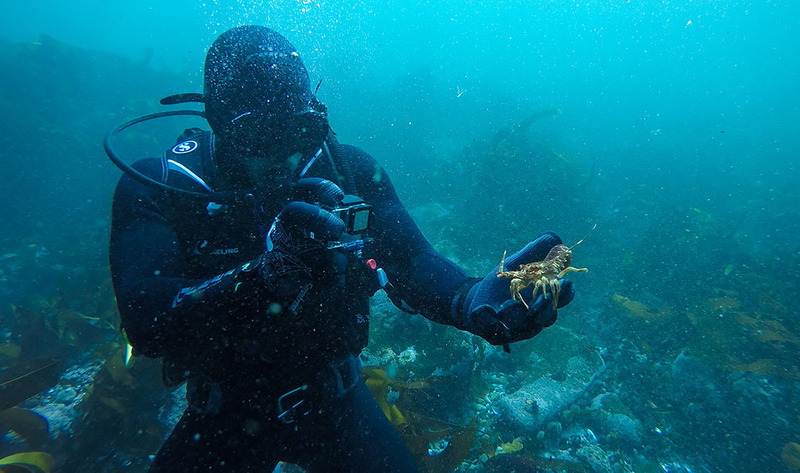 I was starting to shiver near the end of the dive but nothing too bad. Back on the boat. There was hot chocolate to drink and warm water to pour inside your wetsuit too to help warm back up. And back onshore at Hout Bay just after 12pm where I met up with Rianda and her mum again and went for a walk along the wharf. 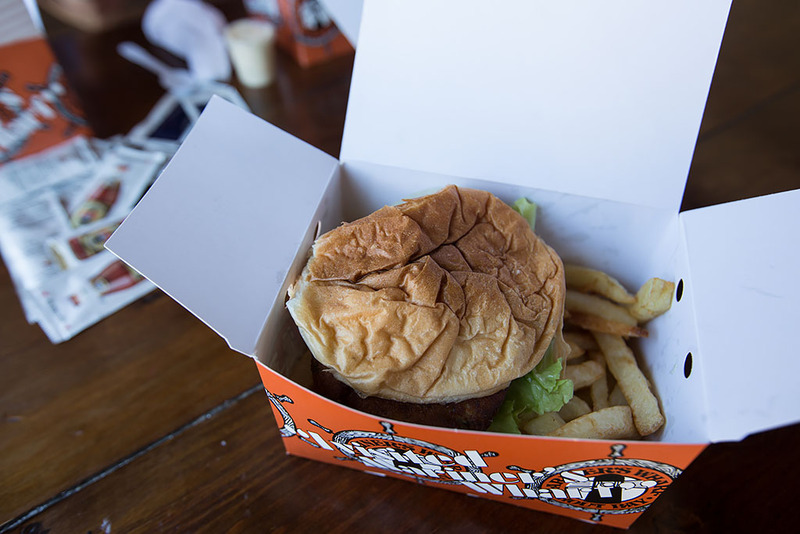 For lunch we grabbed a fish burger and chips. Such a beautiful location especially with the perfect weather. 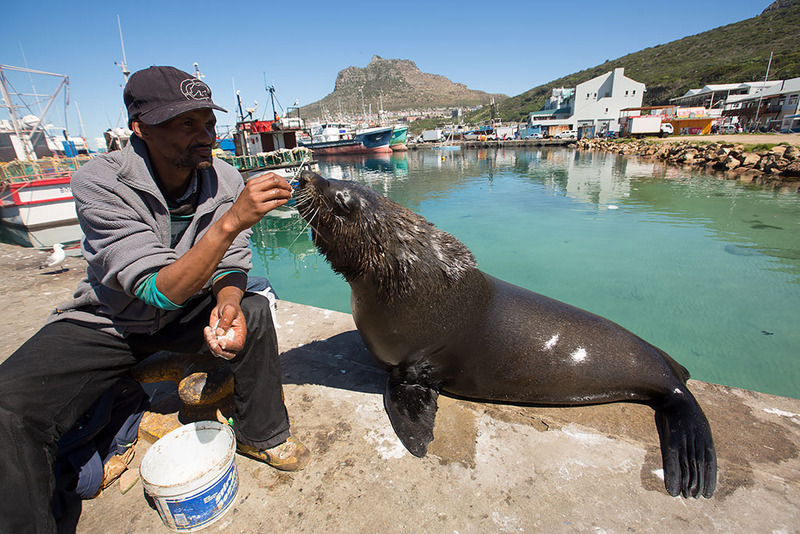 Feeding a portly seal for tips. At about 1pm we got in the car and drove onto the scenic Chapman's Peak Drive. 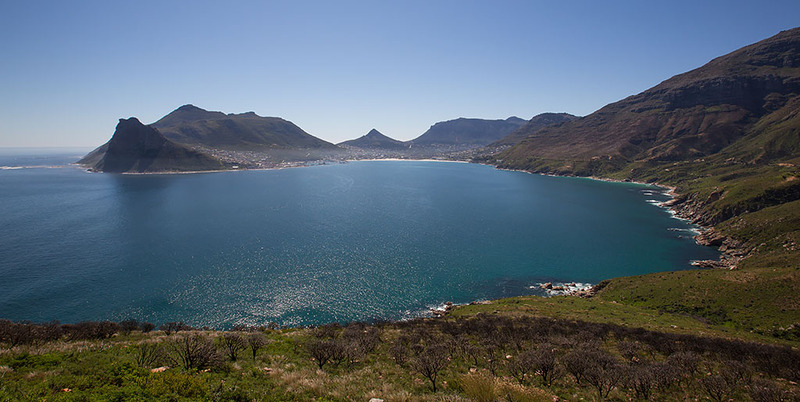 Stopping at a lookout point to take in the view over Hout Bay. 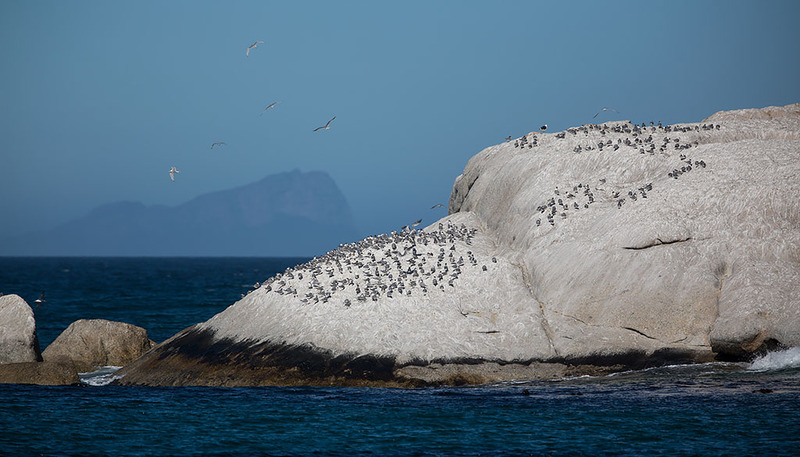 On the far left is Duiker Island, where I went diving in the morning. And a close up of the island with the hundreds of seals on the rocks. 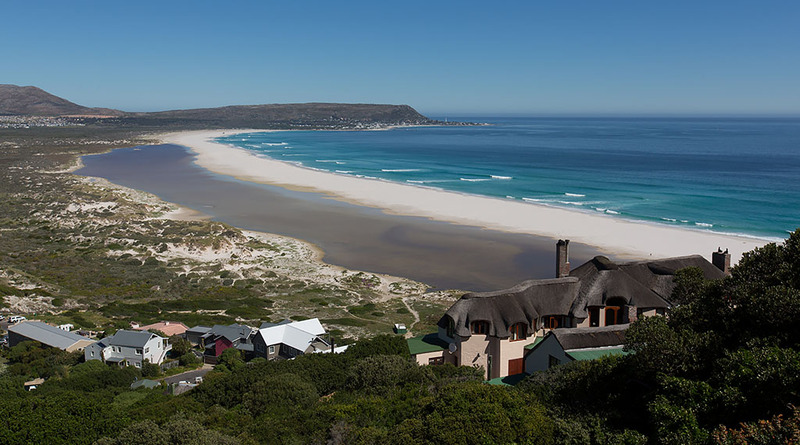 We then drove further on before stopping to take in the view of Noordhoek Beach. 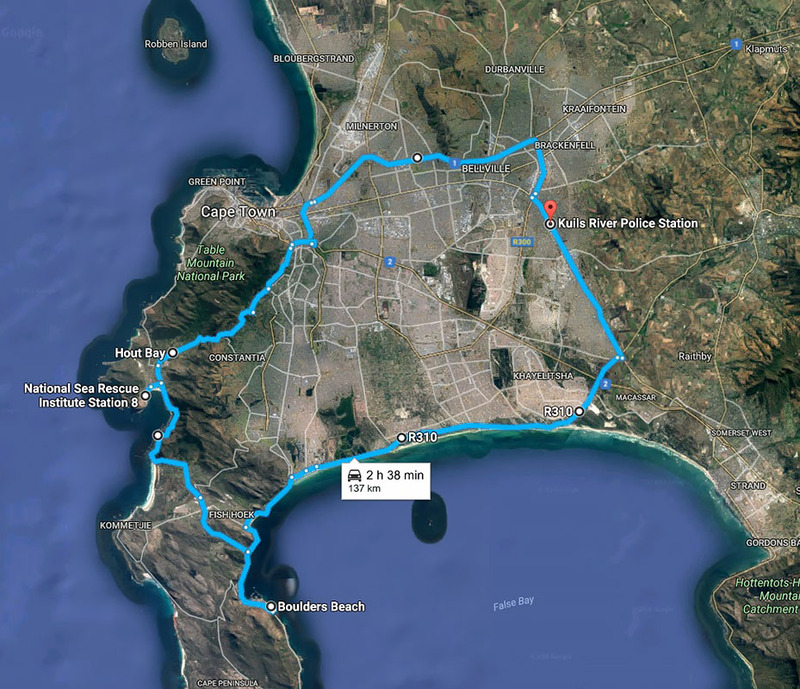 We then carried on to False Bay and onto Simon's Town where we stopped at Boulders Beach. 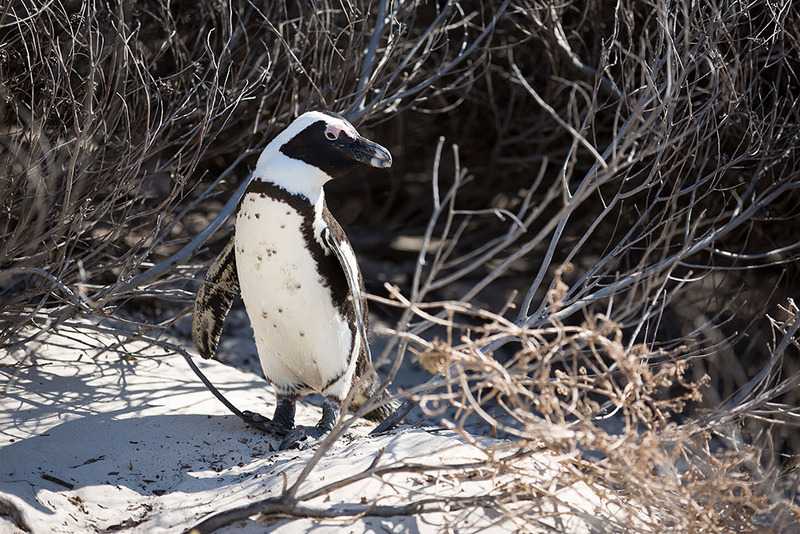 At Boulders Beach there is a colony of the endangered African penguins that have made the place their home. 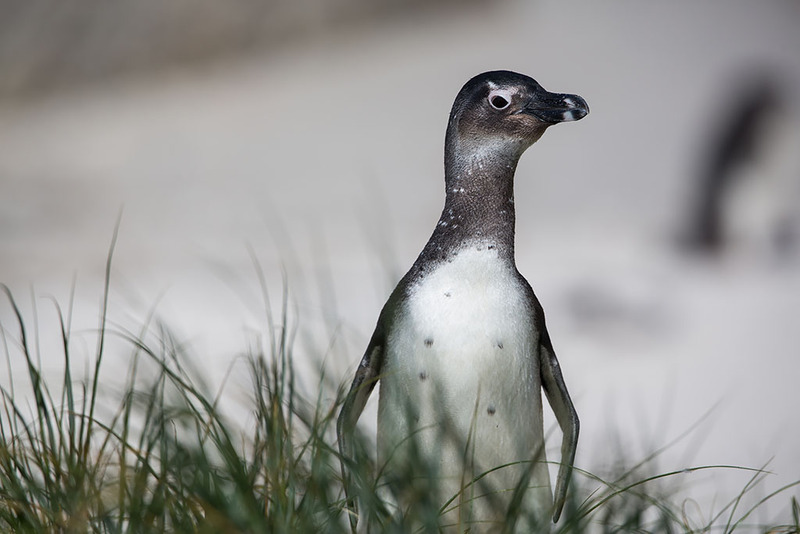 A young penguin peering over the sand dunes. 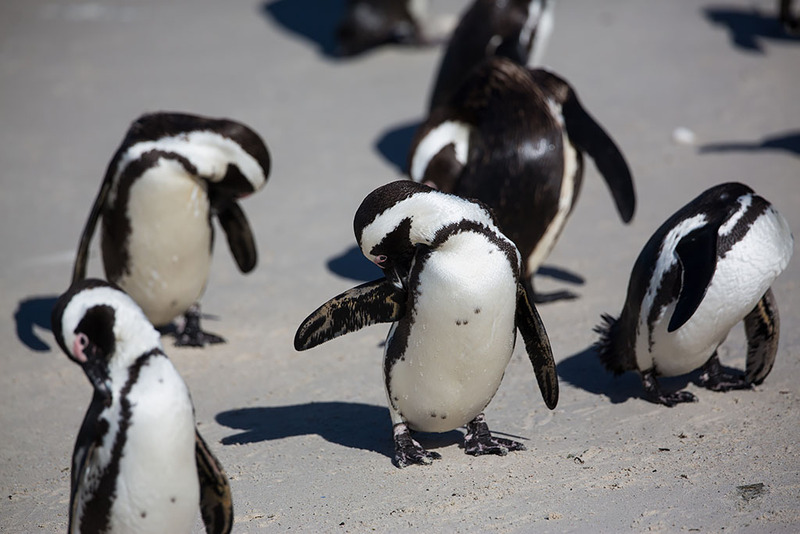 It was my first time seeing penguins in the wild and it was quite an experience. 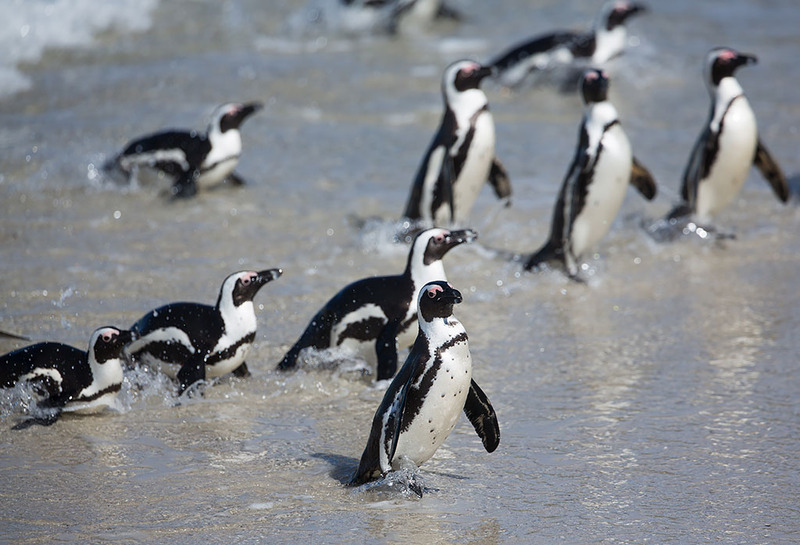 With a population in the early 19th century of ~4 million, in 2000 there was only an estimated 200,000 birds. In 2010 the population decreased further to 55,000 and is anticipated to become extinct in 15 years if the decline is not halted. And up on two feet. 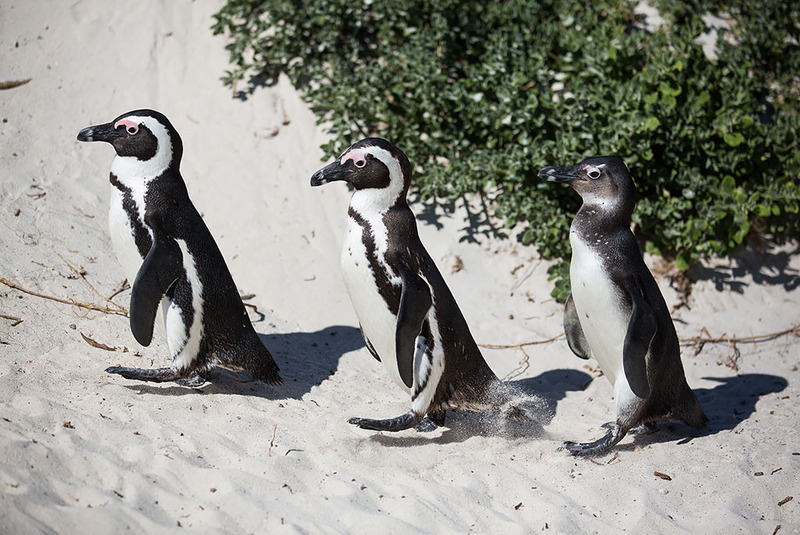 The penguins first settled on Boulders Beach in 1982. 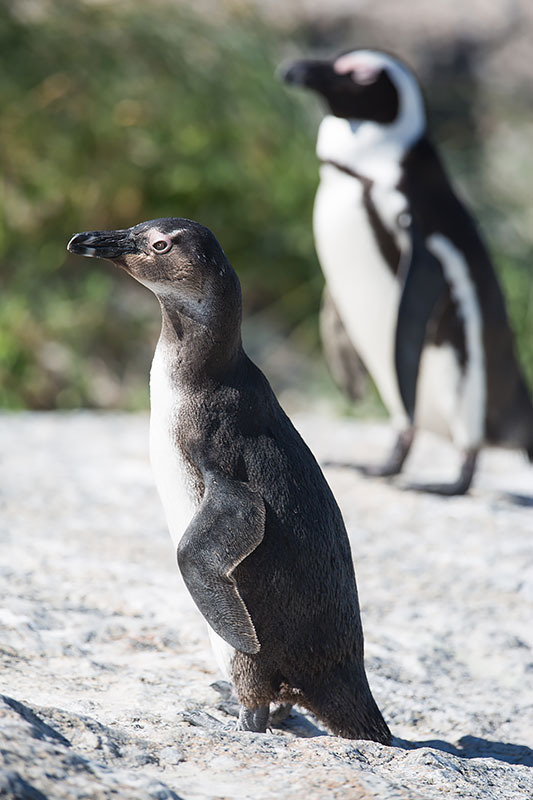 From originally just two breeding pairs, the colony has now grown to almost 3,000 birds. 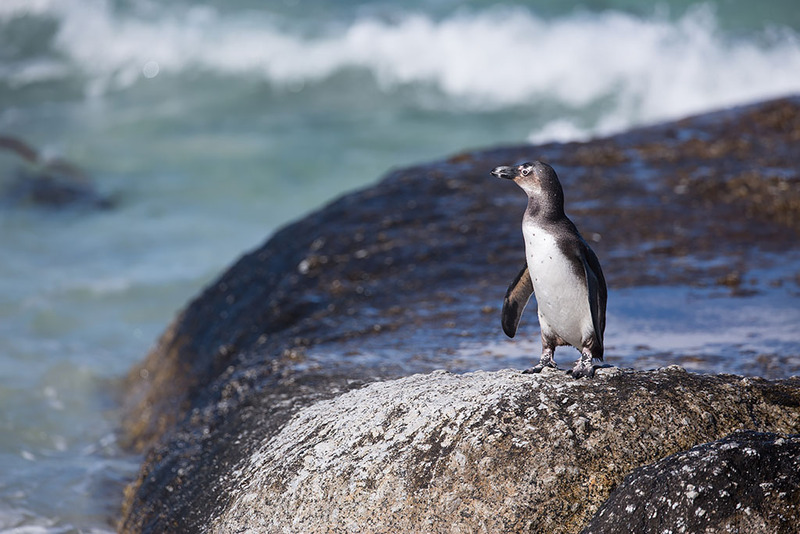 This is partly due to the reduction in commercial trawling in False Bay, which increased the supply of pilchards and anchovy for the penguins. Seagulls in the distance sitting on the rocks. 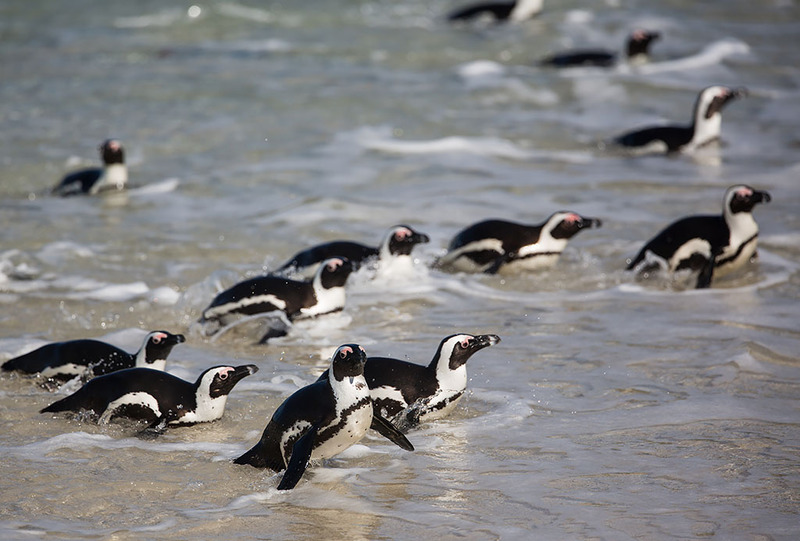 A younger penguin about to test the waters. 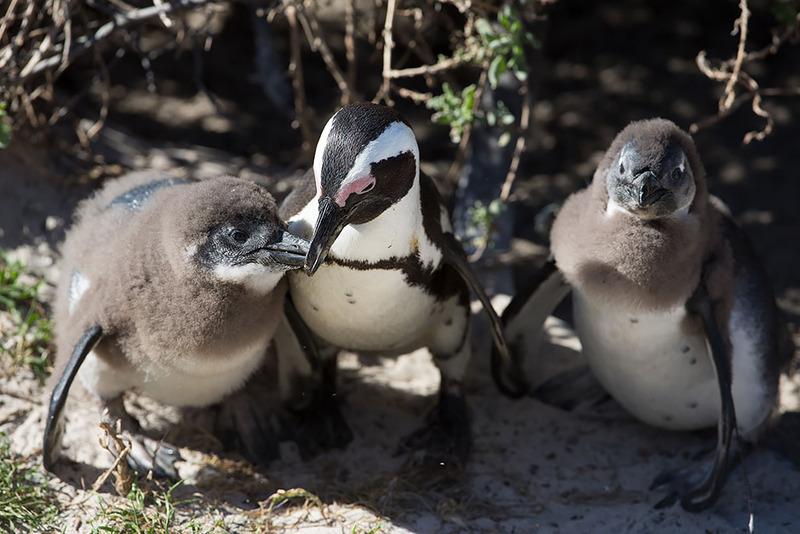 An adult penguin feeding her chicks. 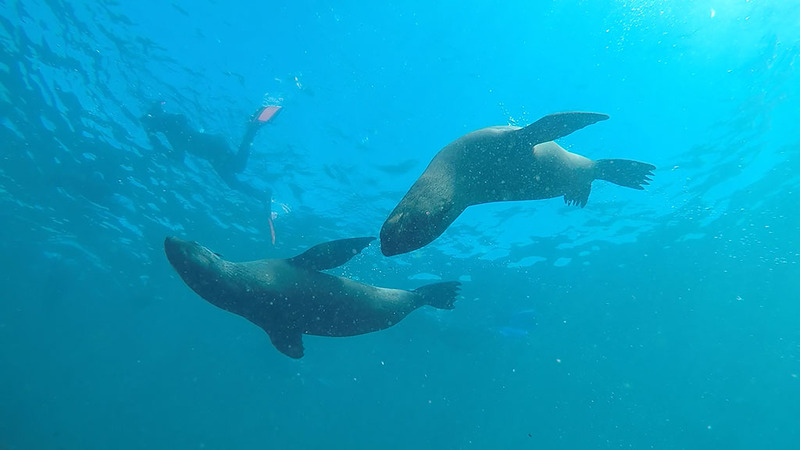 It was another amazing and unforgettable experience to see some beautiful creatures in the wild! On the walk back to the car we couldn't resist getting an ice cream for 25 rand. 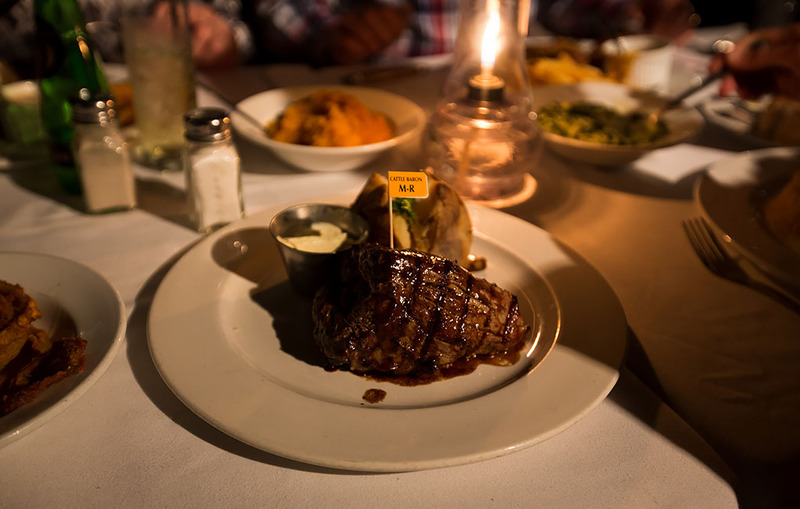 After the drive back to Kuils River, we went out with Rianda's Auntie Matie and Uncle Philip for dinner at Cattle Baron, a South African steakhouse. 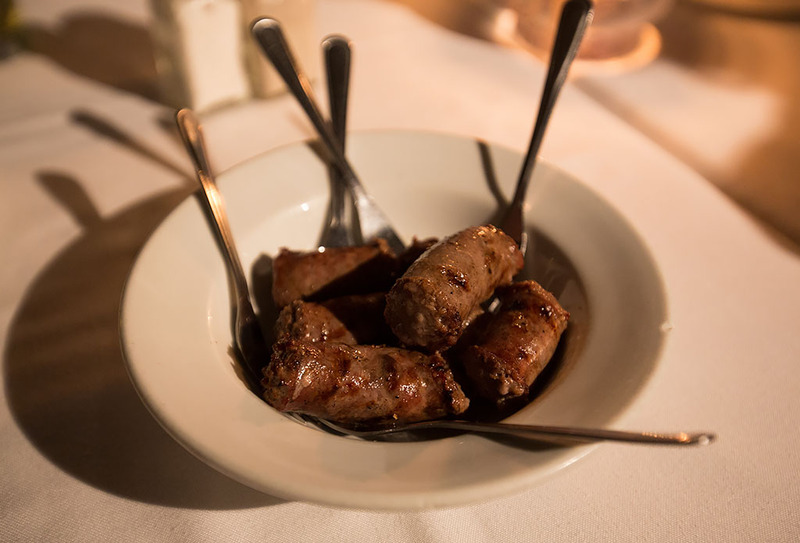 I was keen to have a decent South African meat fix and had some boerewors to start. Followed by the mouth-watering delicious Fillet Kasbah, as 300 gram steak stuffed with crispy bacon, camembert wedges & peppery jalapeños. 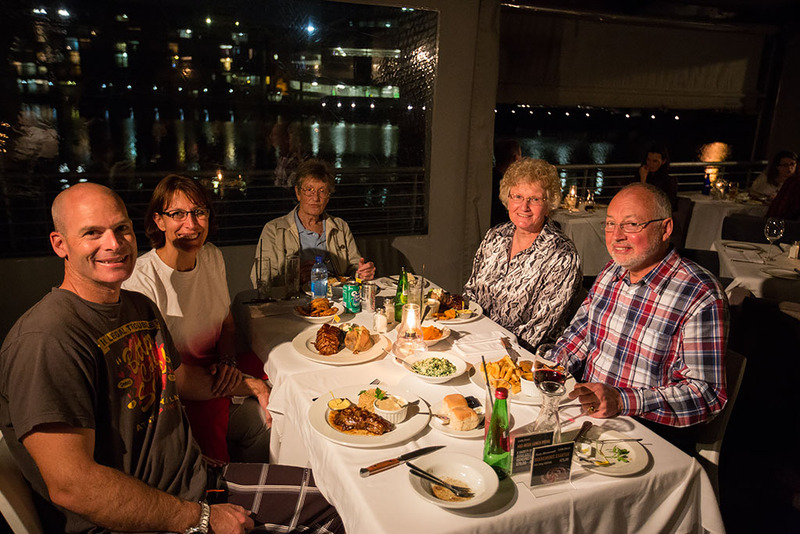 A very tasty meal and for only 1100 rand or $80 for dinner and drinks all five of us it was very reasonably priced too. 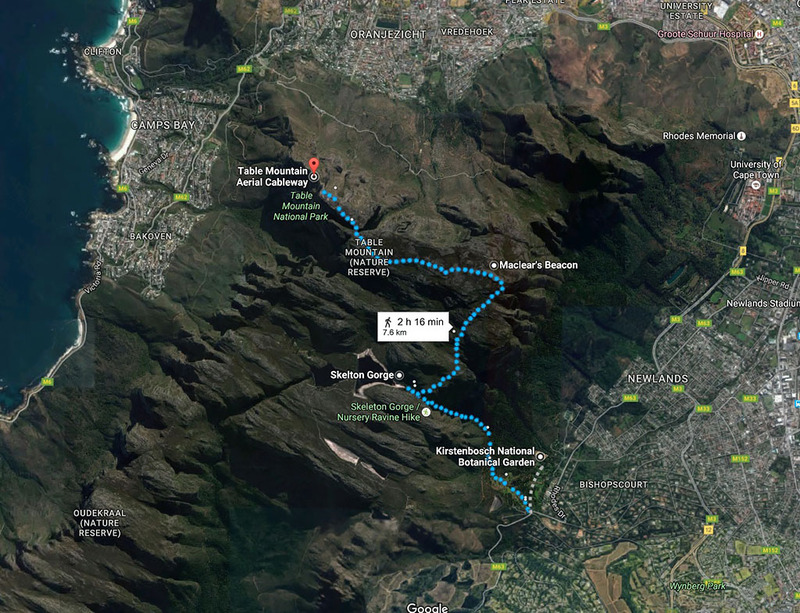 Today's plan was to drive into the city today and climb up Table Mountain via Skeleton Gorge, then up to Maclear's beacon, the highest point of the mountain, before descending back down on the mountain cable car. 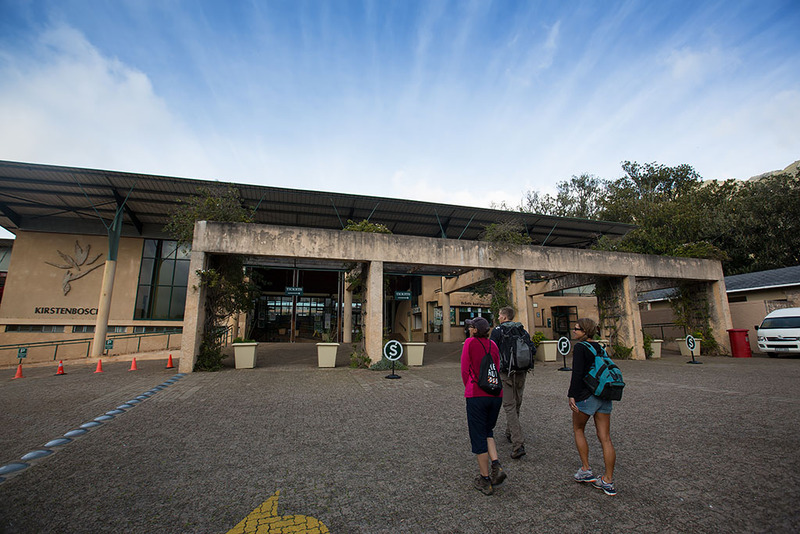 After parking the car in the carpark at the bottom of the Table Mountain cable car, we met up with Matt, our guide for today, then drove in his car around to Kirstenbosch National Botanical Garden for the start of the hike. Also joining us on the climb today was Rianda's cousin's wife, Elmarie. 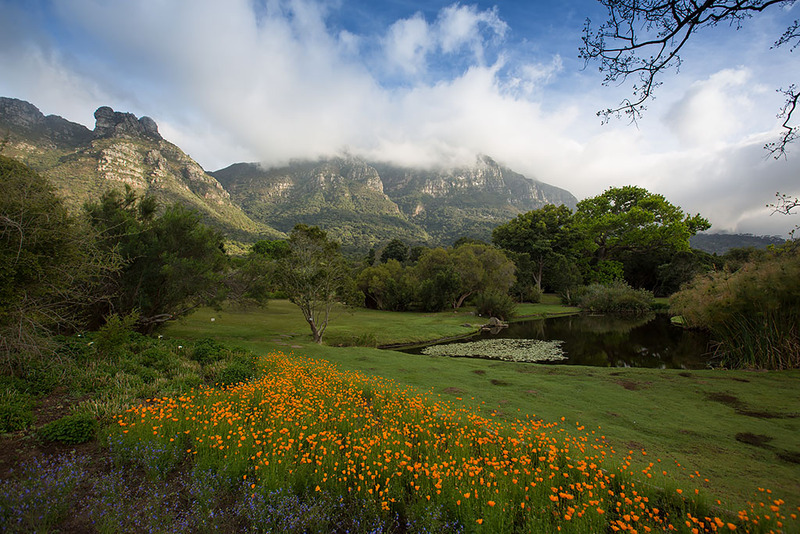 Kirstenbosch is the most famous of South Africa's nine National Botanical Gardens. 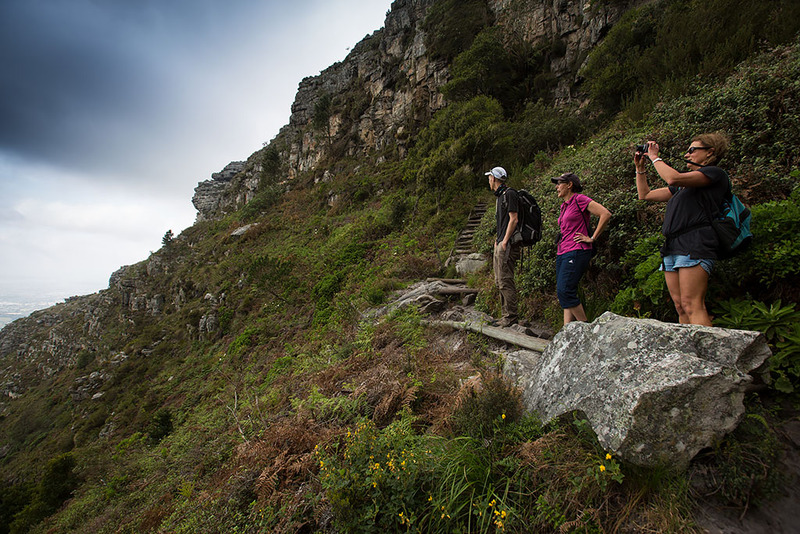 And starting our hike up Skeleton Gorge, a ravine up Table Mountain that climbs up 6.2 km and gains around 930 meters in elevation. 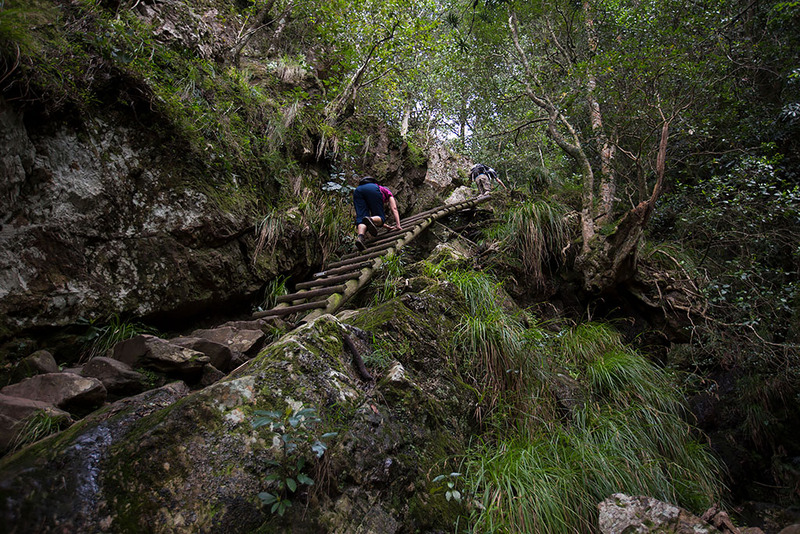 As we climbed up it got progressively steeper, with the climb progressing from steep stairs to ladders. 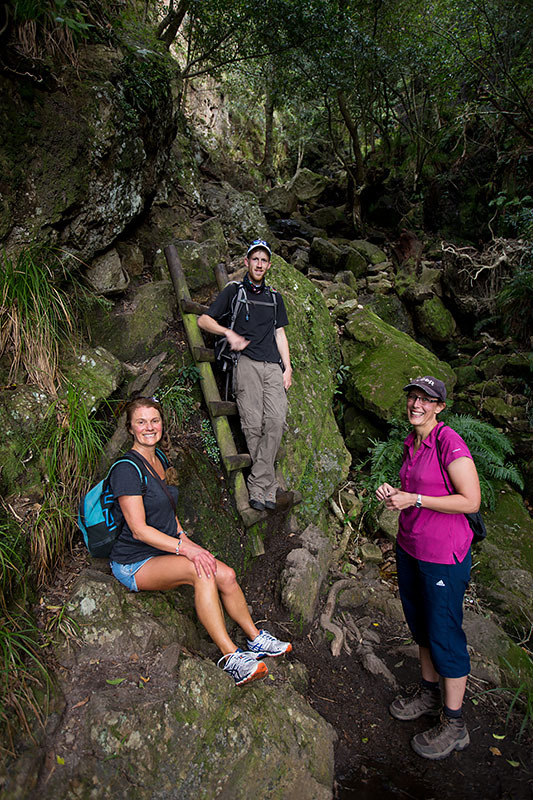 And taking a bit of a rest before tackling the climb on all fours up the rocks and boulders. Taking in the view after the steep part of the climb was over. The weather was very different from the cloudless sky of the past two days. Stopping at Hely-Hutchinson Reservoir. Apparently this is a good place for a dip in the summer, but far too cold and windy for that today! 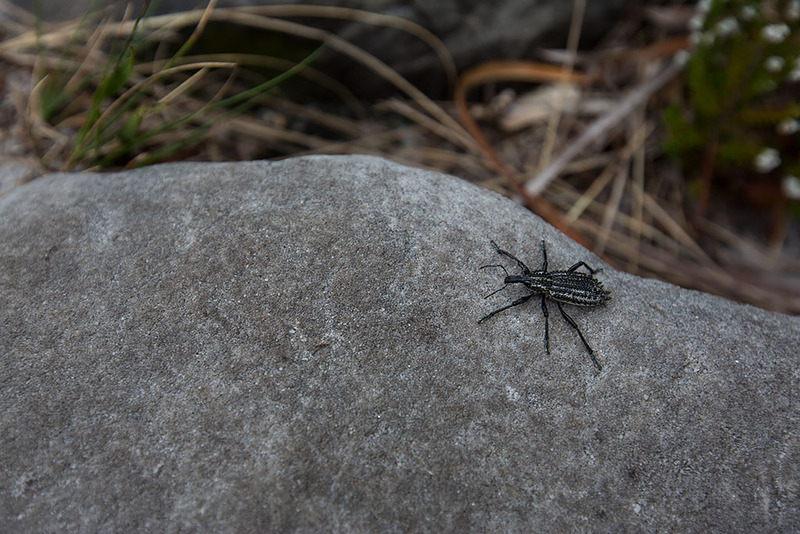 An African Tapering darkling beetle sitting on a rock as we continued our trek. At Castle Rock as we ventured into the clouds. 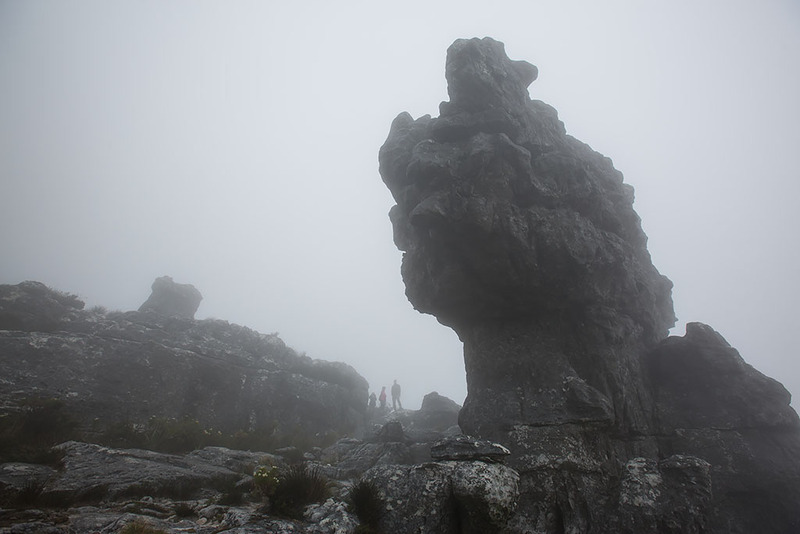 At Maclear's Beacon, the highest point on Table Mountain at 1,086 metres above sea level and is marked by a large cairn, built by Sir Thomas Maclear in 1865. It was pretty windy and biting cold! 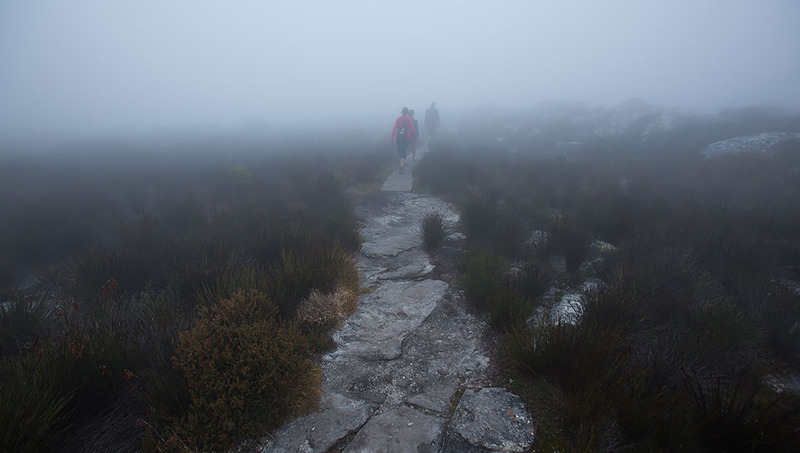 And walking further on to the actual 'table' or top plateau of Table Mountain. 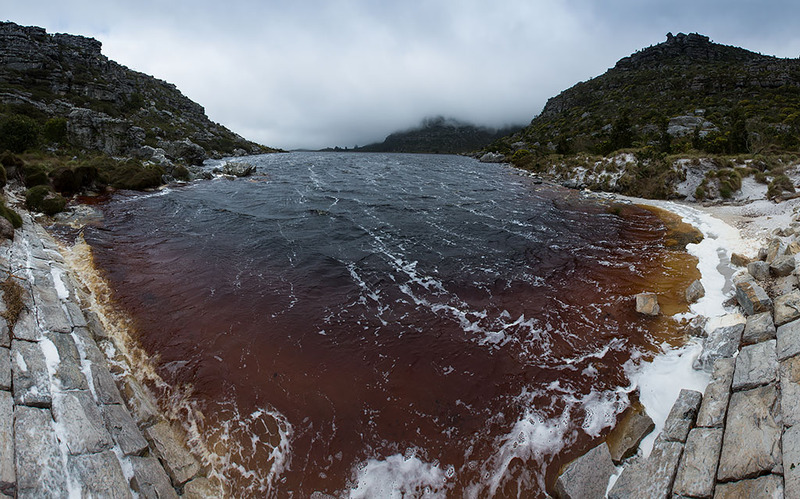 There was quite alot of water and reeds about, with lots of croaking by South African Mountain rain frogs. 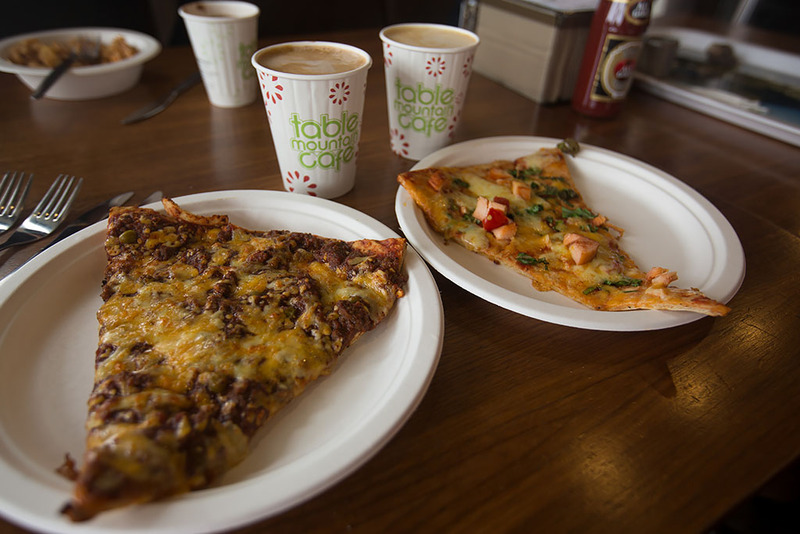 At about 1pm we made it to the cable car station where we grabbed some pizza and coffee for lunch. 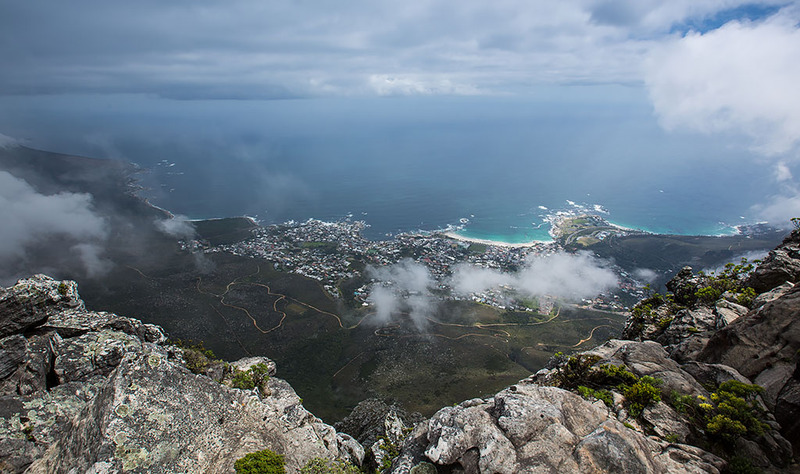 After waiting a while the clouds finally cleared for a few minutes, allowing a view of Camps Bay just below. 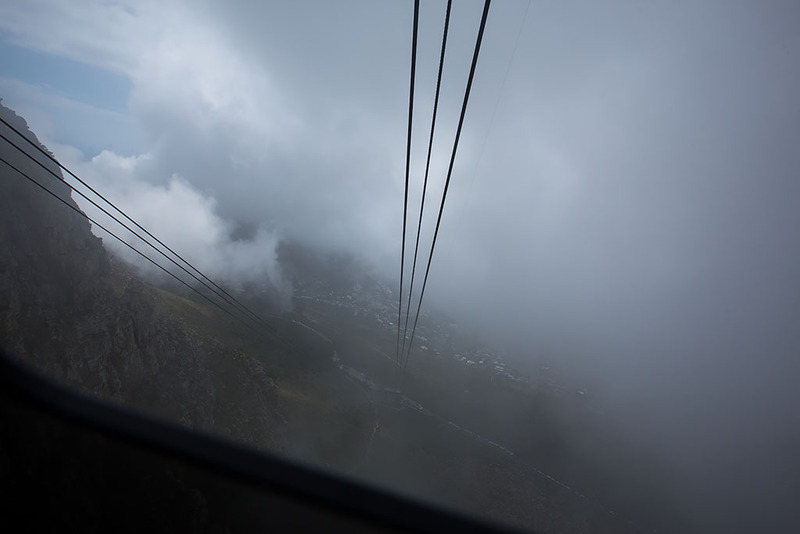 We then headed back down the Table Mountain cable car. 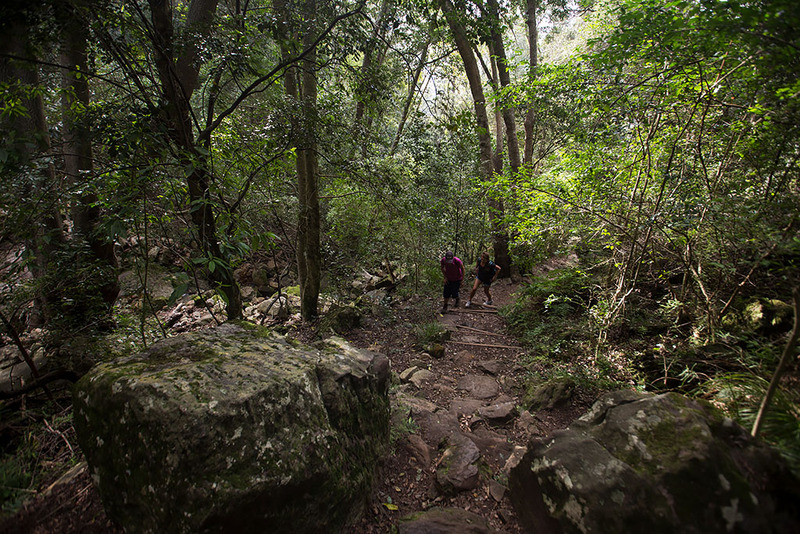 We then drove back around to Kirstenbosch to drop Matt off at his car and thanked him for the great hike. 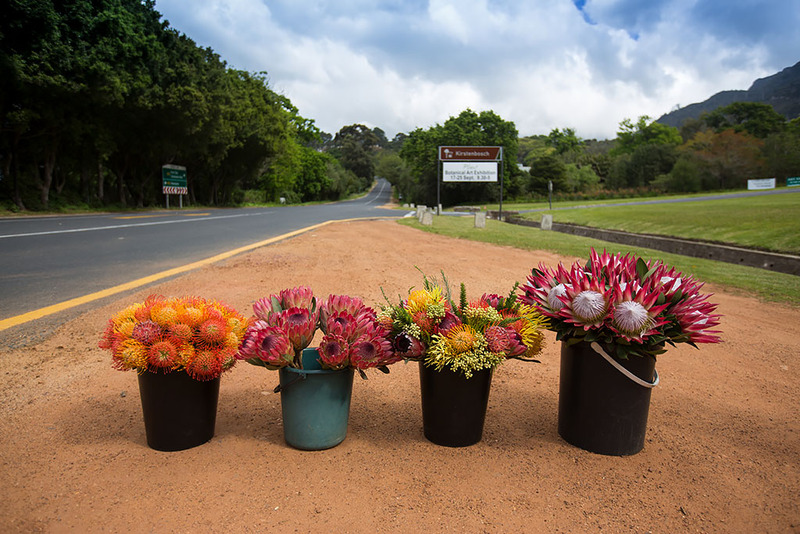 Rianda also stopped to buy some flowers to take home from a road-side seller, including some King Protea (far-right), the national flower of South Africa. 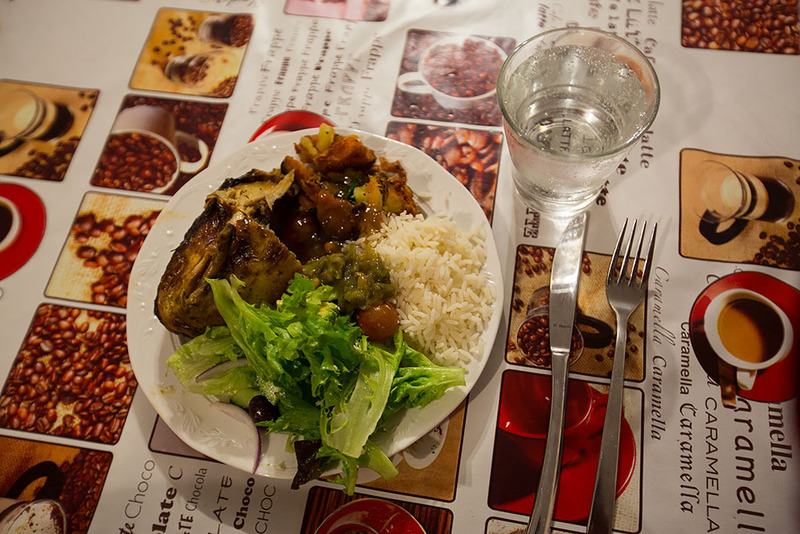 In the evening we headed out to the nearby suburb of Brackenfell to see Magduldt and her family, a cousin of Rianda whom she also used to flat with, and enjoyed some roast chicken and rice for dinner. Magduldt also shared some stories of Rianda in her younger wild days and about how they used to stay out until the wee merry hours with the help of alot of Tequila! 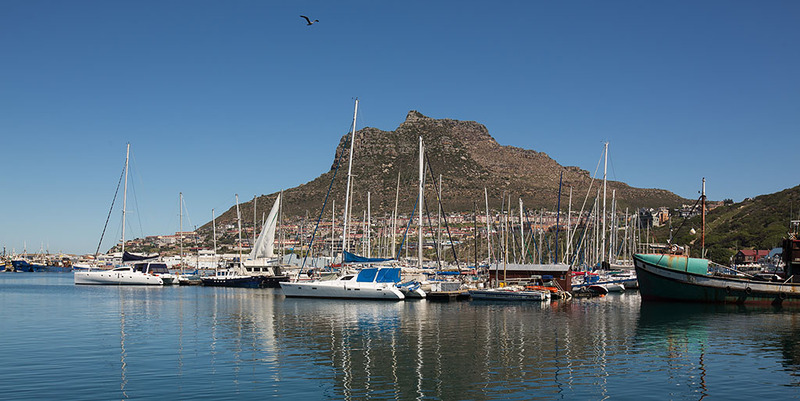 Unfortunately our luck with the weather had well and truly run out and there was continuous rain for our fourth and final full day in Cape Town. 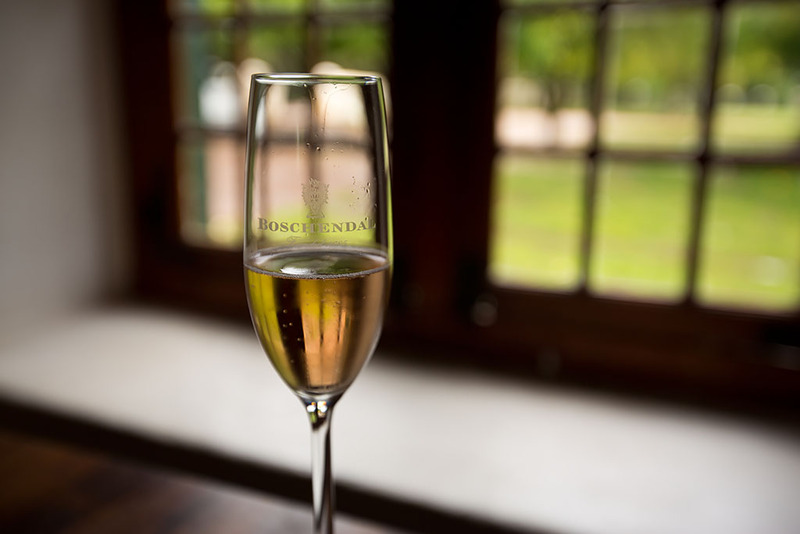 From a suggestion yesterday from Magduldt we headed for a drive to Boschendal, a wine estate between Franschhoek and Stellenbosch. 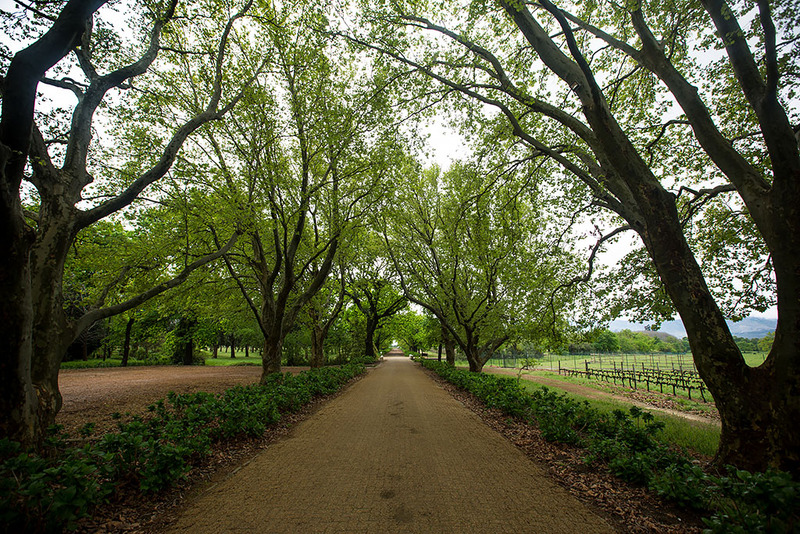 Dating from 1685, Boschendal is one of the oldest wine estates in South Africa. 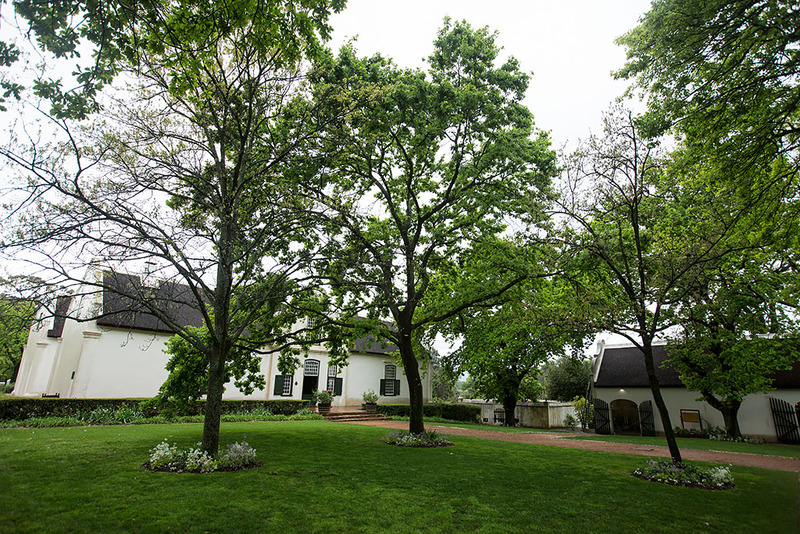 All of the buildings on the estate were built in the beautiful Cape Dutch architecture style. 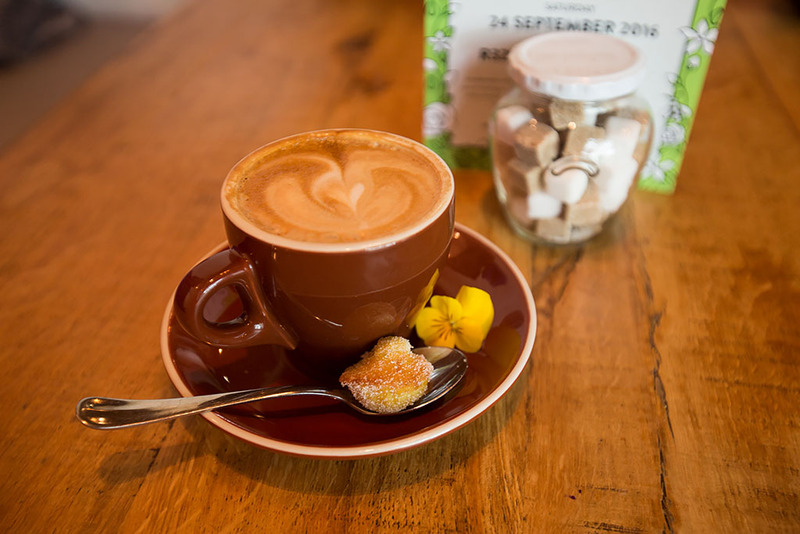 As it was still quite early, we retreated inside away from the rain into the café for some coffee. 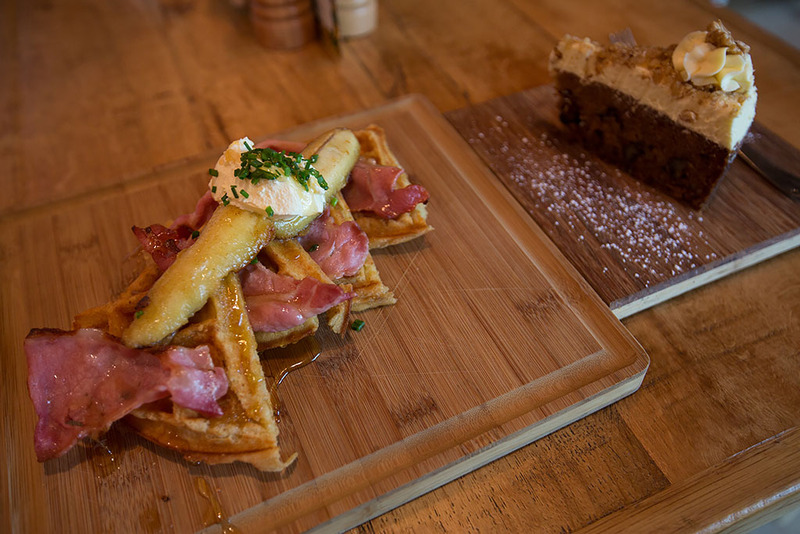 And also treated ourselves to the tasty bacon and banana waffle and carrot cake for morning tea. 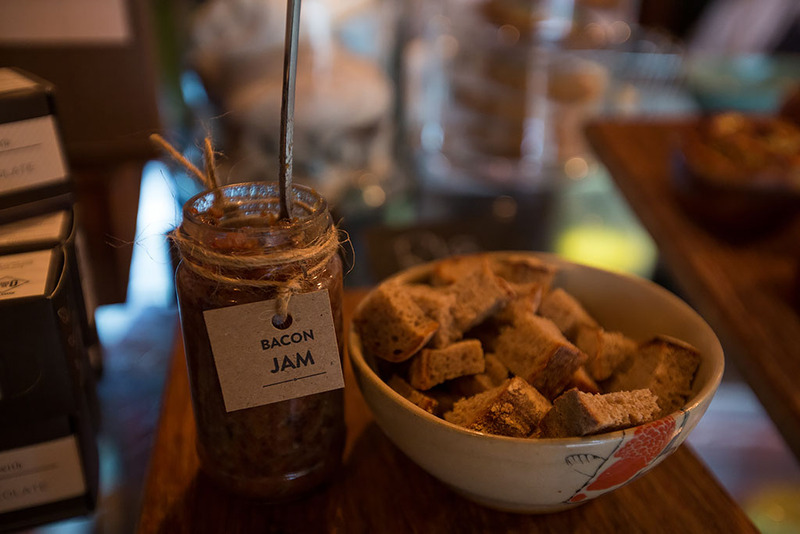 They also had a delicatessen with local delicacies for sale, including some intriguing and very tasty bacon jam! It was only 20 rand ($1.40) a jar so I grabbed a couple to take home. 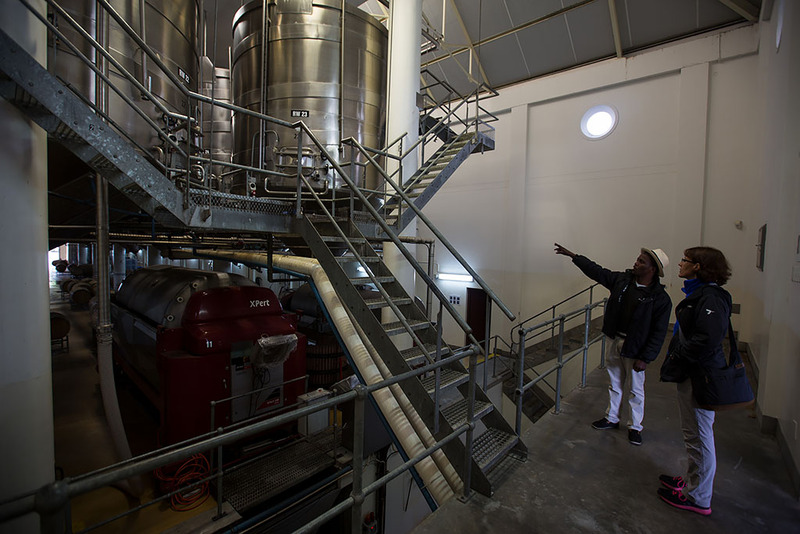 We then enquired about doing a tour of the wine making process as well as some wine tasting. The next available tour slot was ~45 minutes so we were given a glass of sparkling wine while we waited. We then met up with our guide, Walter, for our private tour of the wine making process. In the temperature controlled wine fermentation room. 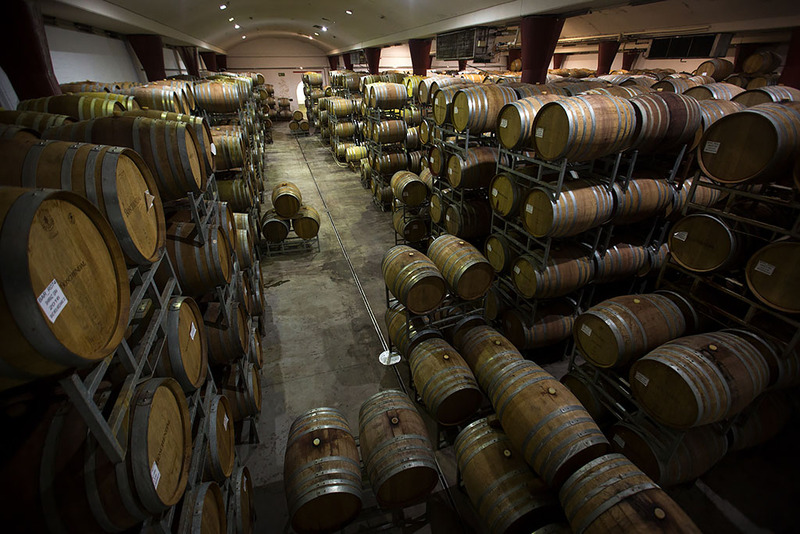 The different varieties of wine aging in the barrels. 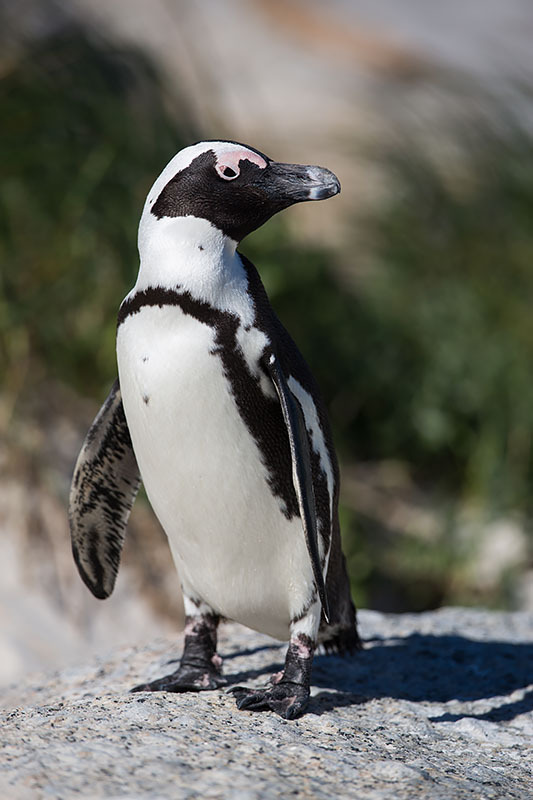 Walter was originally from Johannesburg and was Zulu, and often got mistaken for a local who spoke Xhosa. 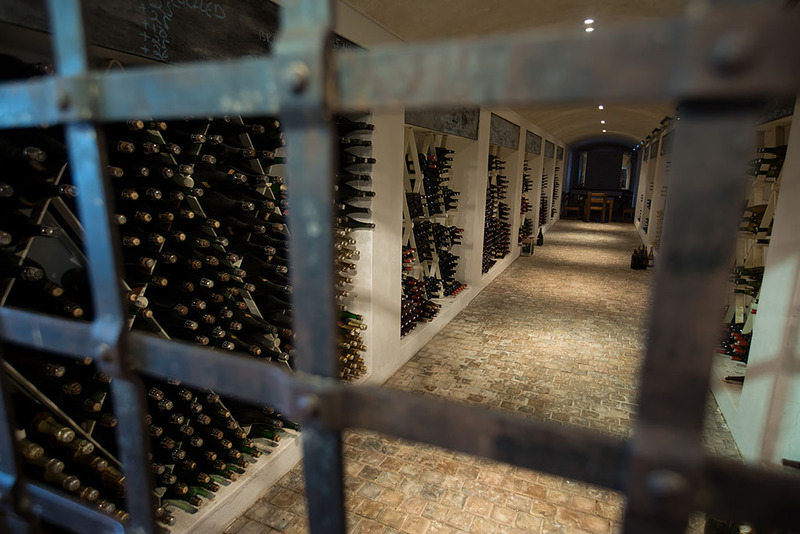 The cellar where they stored various vintages dating back to 1901. We then moved on to the wine tasting room. We could taste the normal wines for 40 rand (~$3) or pay 80 rand for the 'premium' wines, which we opted for. Although twice the price, the premium wines were still very affordable though at 245 to 295 rand ($18 to $21) each. The first wine on the list was the 2009 Grand Cuveé Brut. 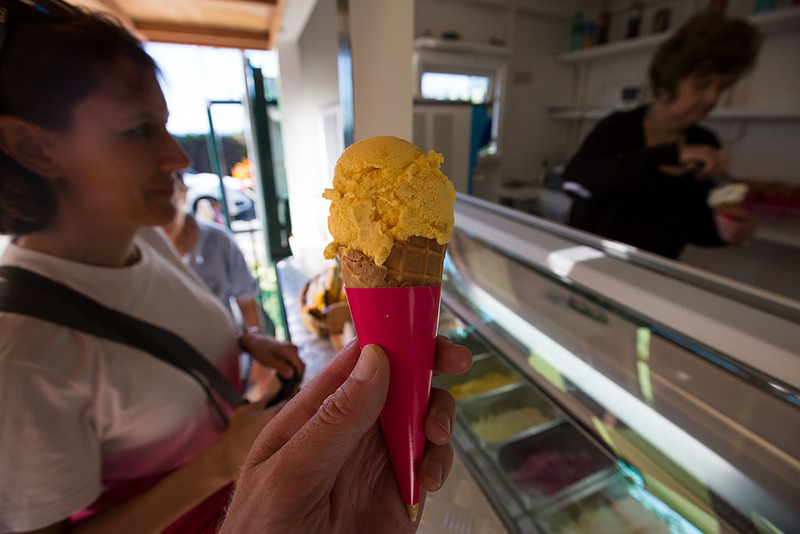 Elegant tangerine, enlaced with honeycomb and glazed nuts. 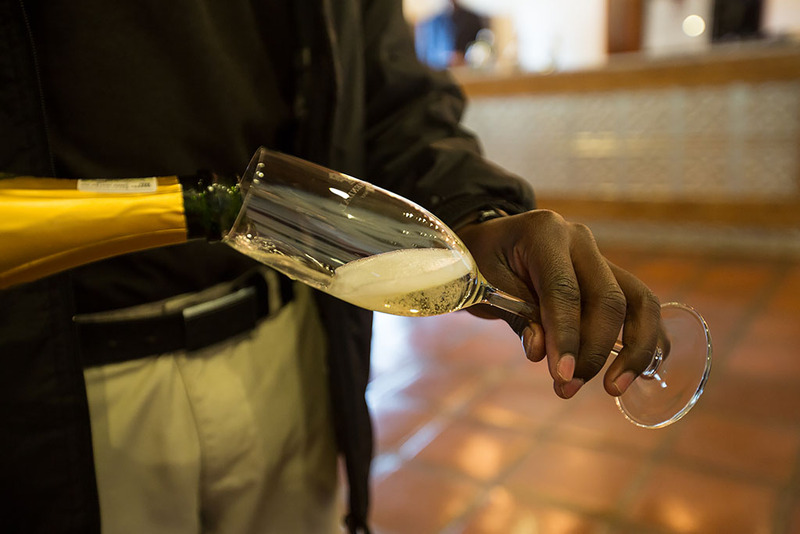 Extended lees contact gives a full and creamy mouthfeel with elegant minerality, good balance and a seamless finish. It was a great wine to start the tasting. Next was the 2014 Elgin Sauvignon Blanc. Limey, chalky characteristics carry through to a broad yet intricate palate detailed by a distinct minerality and riveting freshness on a lingering zesty finish. A very tasty white wine which we really liked. 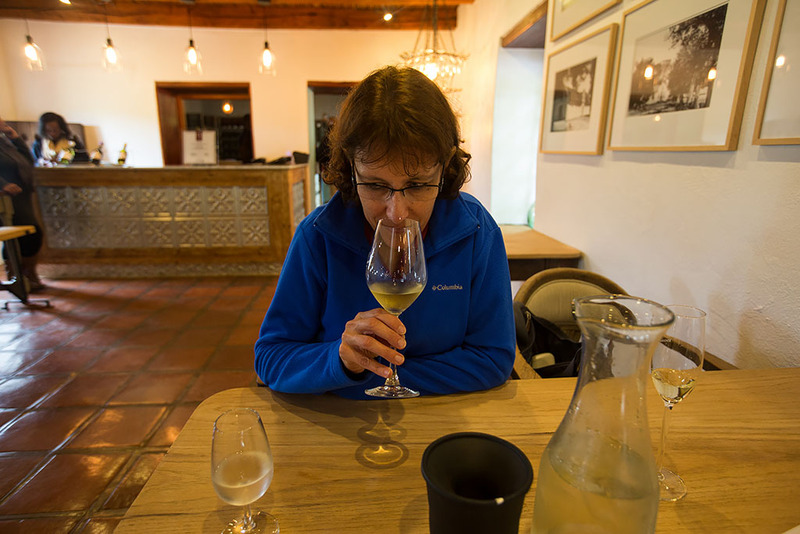 Rianda smelling the next wine, the 2013 Elgin Chardonnay. Expressive grapefruit and Golden Delicious apple aromas detailed with graceful lime blossom, frangipani and white truffle aromas further embellished by discreet vanilla oak spice. Another decent white wine with agreeable taste and flavour. Walter pouring the 2013 Elgin Pinot Noir. An intricately structured wine with a delicate entry, blossoming into a poised concentration of wild berry flavours and oak spice. Gains complexity and richness before ending with a long, finely textured finish. 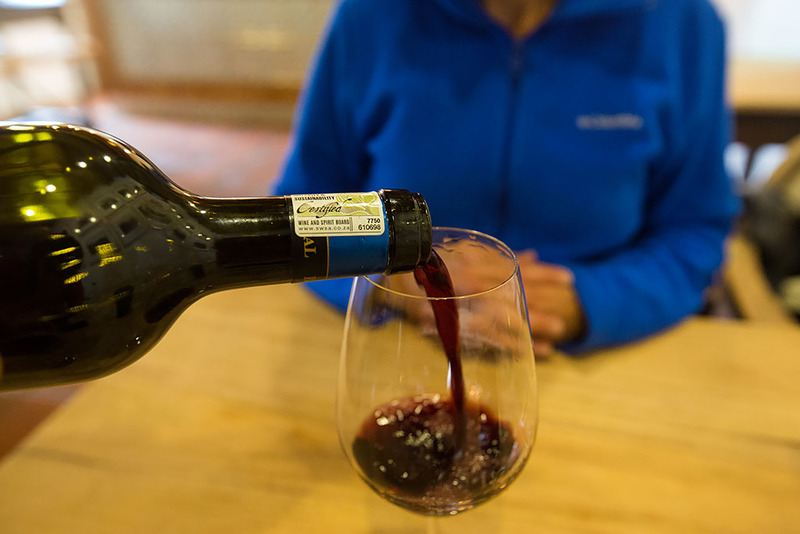 The first red wine was a nice change from the whites and which we definitely savoured and appreciated. And the last wine, the 2013 De Werf. 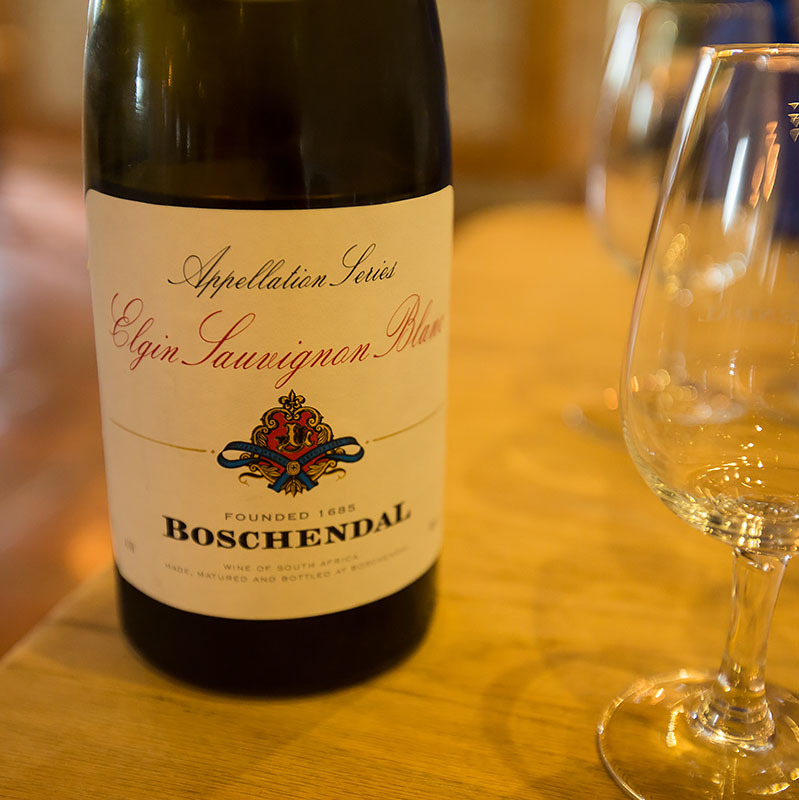 A full-bodied wine with a cool-climate, silky elegance that is complex, rich and has a good balance. Refined, good integration of the varietals with each contributing character to the blend. An intense, dense, lingering finish. 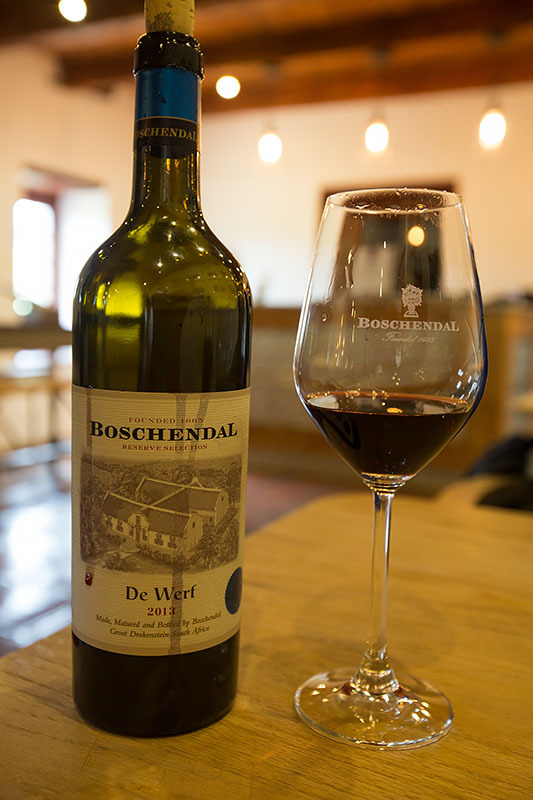 The very interesting De Werf was made from a mixture of Cabernet Sauvignon, Cabernet franc, Merlot, Petit verdot and Malbec. 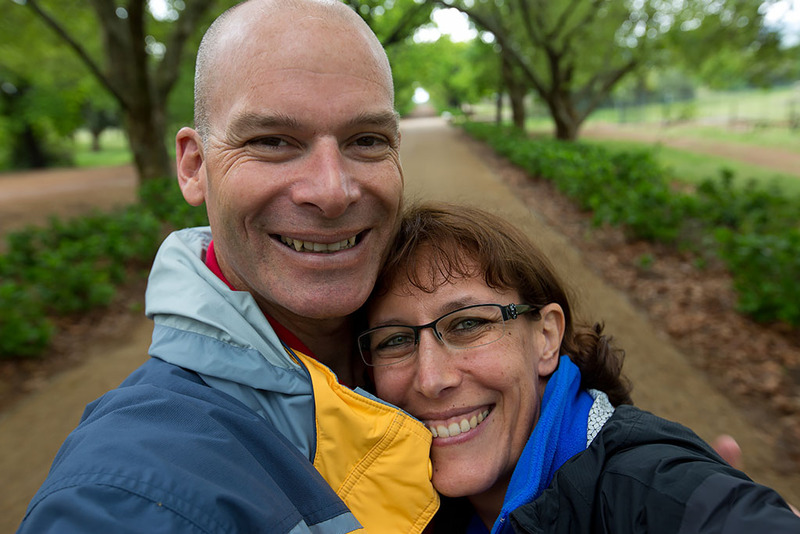 After buying a bottle of the Grand Cuveé Brut to take home, we went for a walk through the beautiful grounds. And a goofy selfie to capture the moment! 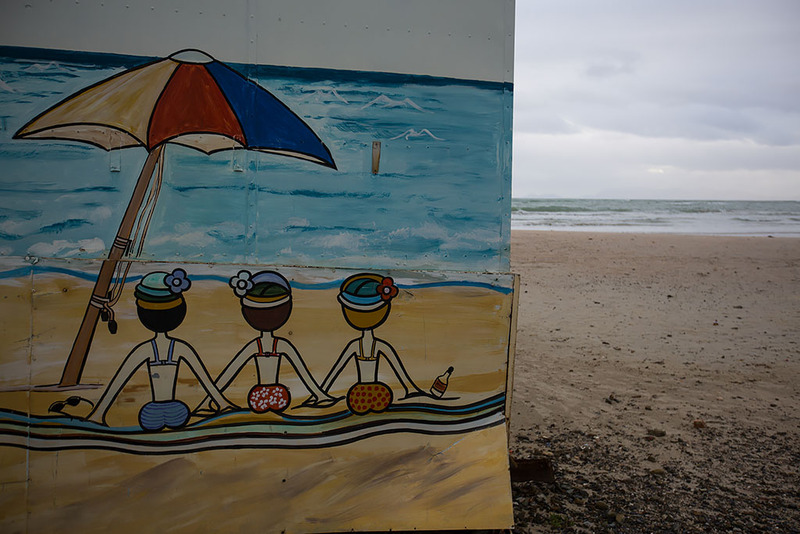 We then went to the Strand (Afrikaans/Dutch for 'beach'), a seaside resort close to Cape Town, where Rianda's Auntie Dillie lived. 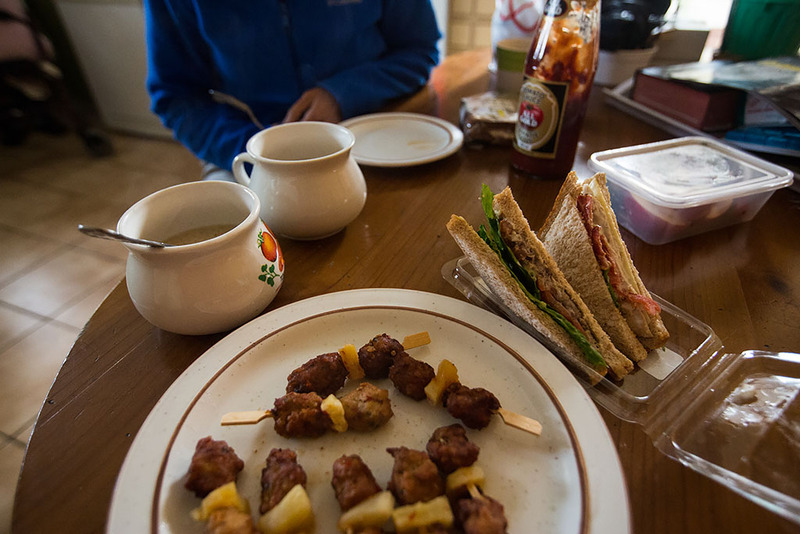 On the way we stopped at a service station to grab some lunch to eat once arrived at Rianda's Auntie's place. 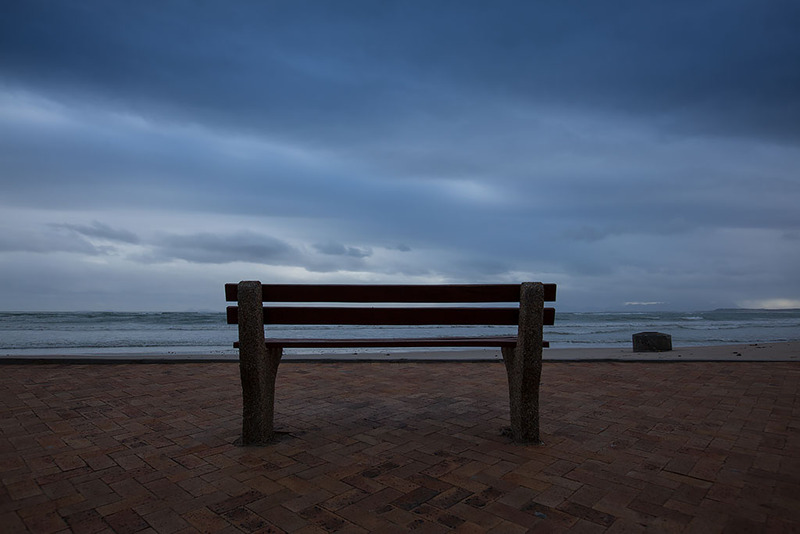 Although the weather was still quite windy and cold, after lunch myself and Rianda went down to the beachfront for a walk. 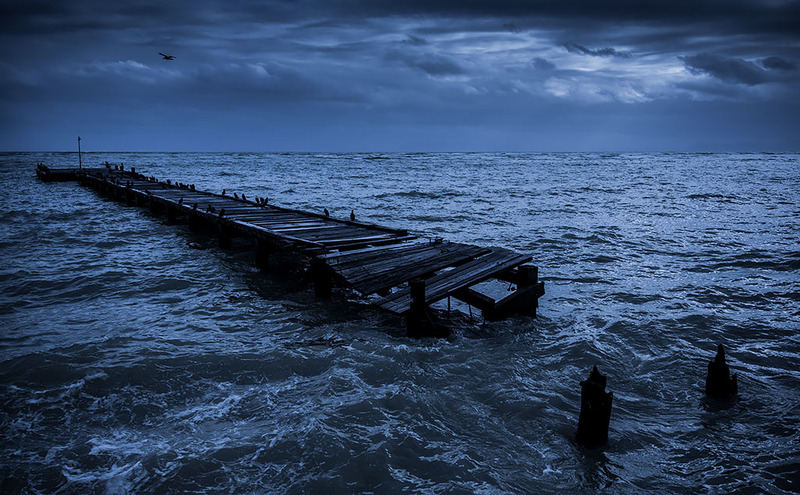 Jetty. In 1970, all black, coloured and Asian people were forcefully removed when the town was classified as a white-only resort. 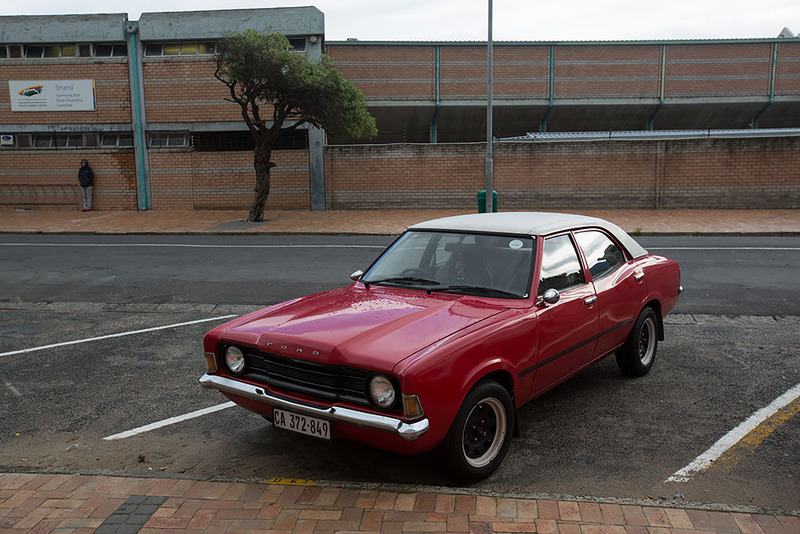 A 1970's Mark II Ford Cortina. 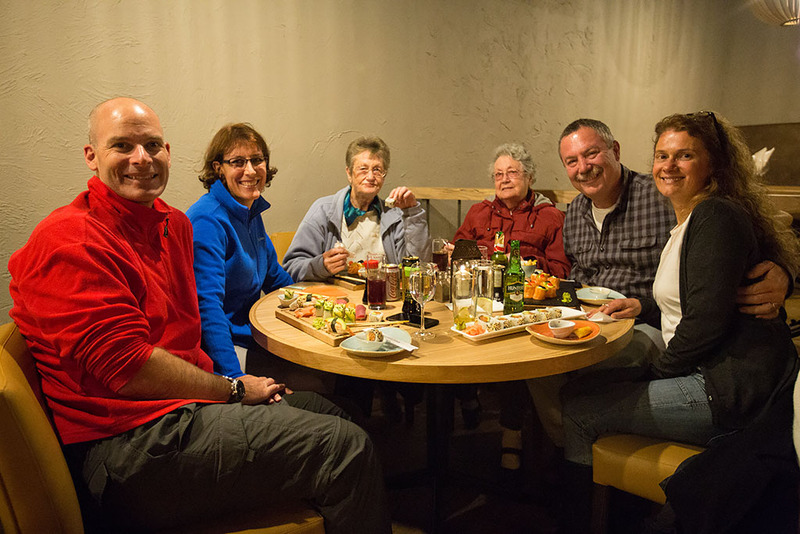 In the evening we met up with Elmarie and Rian, her husband and Rianda's cousin, and along with her Auntie Dillie and Rianda's mum, Tannie Tilla, we went to a local seafood and sushi restaurant, Oceans 8. 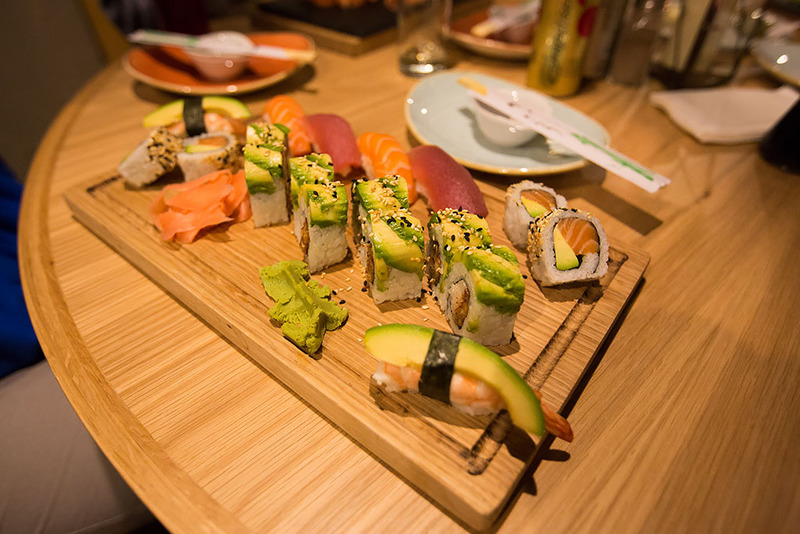 I shared some delicious sushi with Rianda for our last dinner in Cape Town. 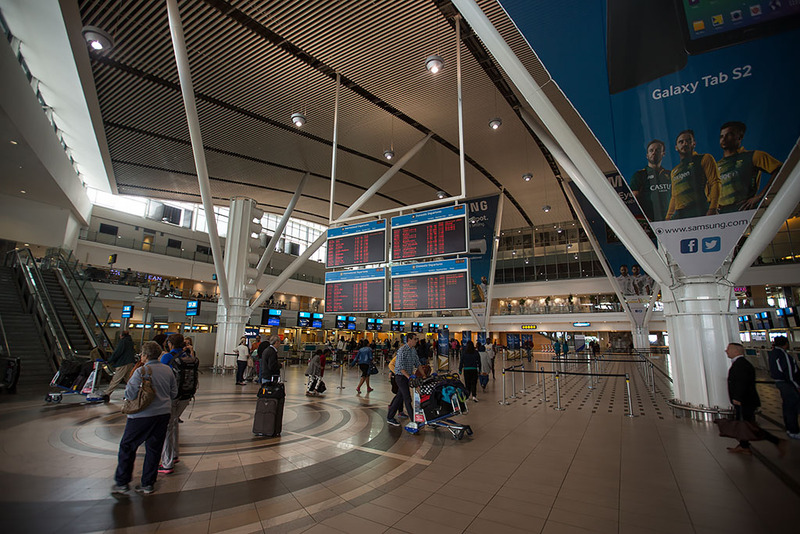 After a last morning run through Kuils River, we packed up the suitcase, and after a last minute stop at the supermarket for some South African groceries to take back to Dubai, we headed to Cape Town International Airport to make the journey home. 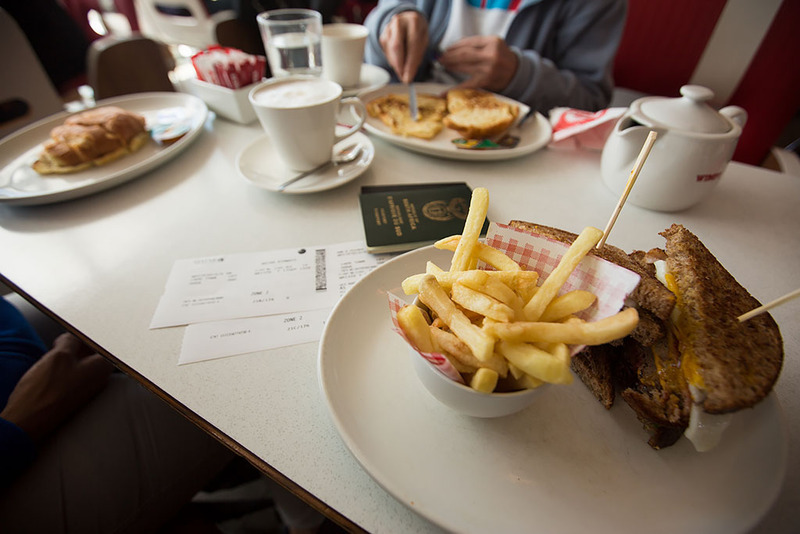 After checking in, we headed to the ground-side Wimpy's restaurant to grab a bite to eat. After saying farewell to Rianda's mum, we lined up for security and immigration. The immigration officer checking our passports noticed our New Zealand and South African passports, and we started chatting about this mornings rugby match between the two countries that had just finished. We hadn't heard the result yet but he reluctantly told us that South Africa had been slaughtered, 13-41. 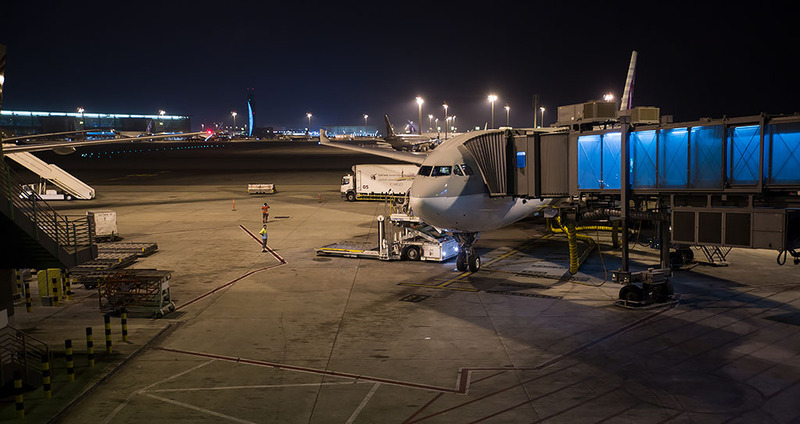 Our QR 787 at the gate. 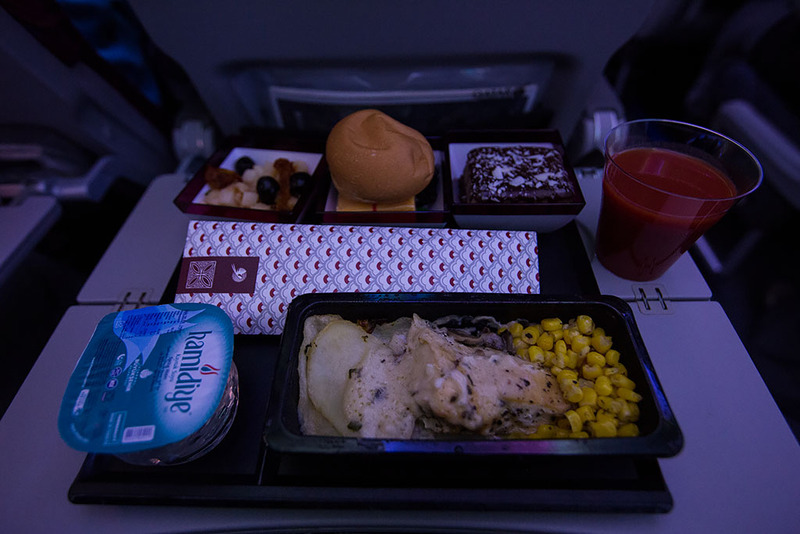 Chicken and potatoes soon after take-off. 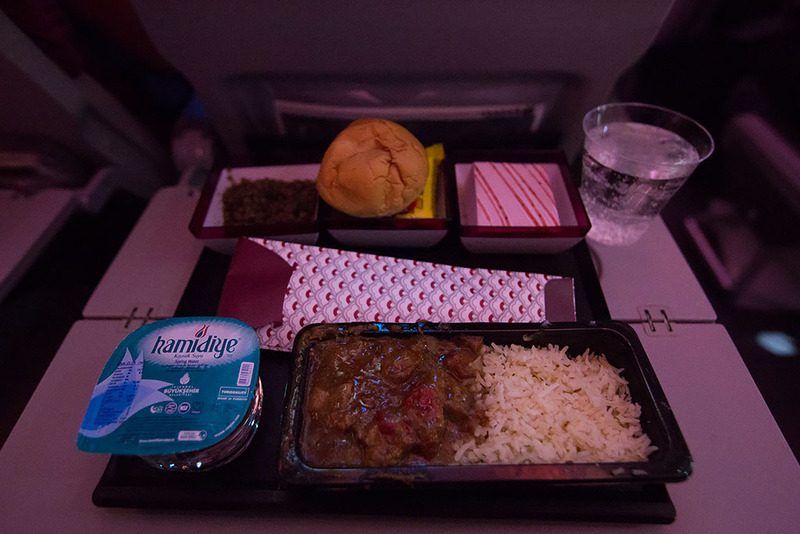 Lamb for dinner somewhere over the Gulf of Aden. 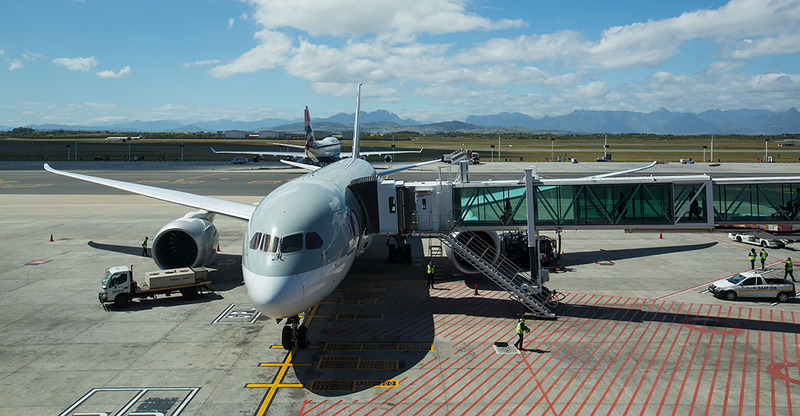 And about to board the QR A330 in Doha for the final flight back to Dubai after an amazing trip back to Southern Africa!